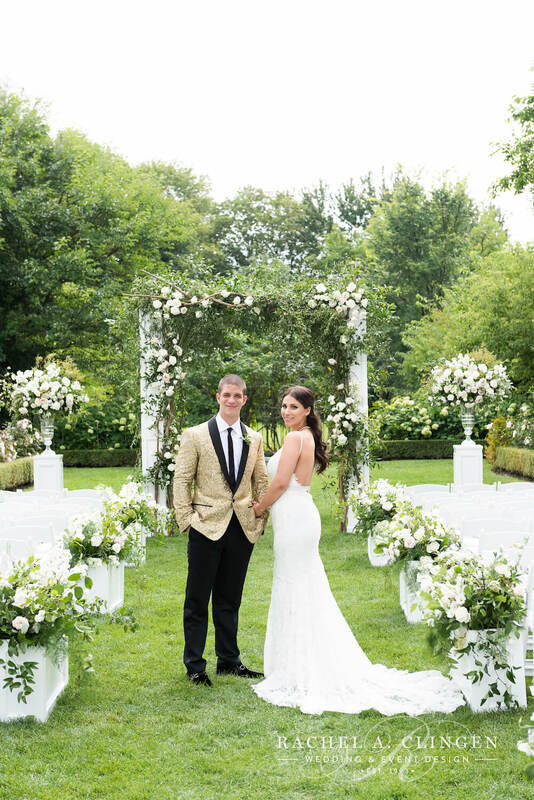 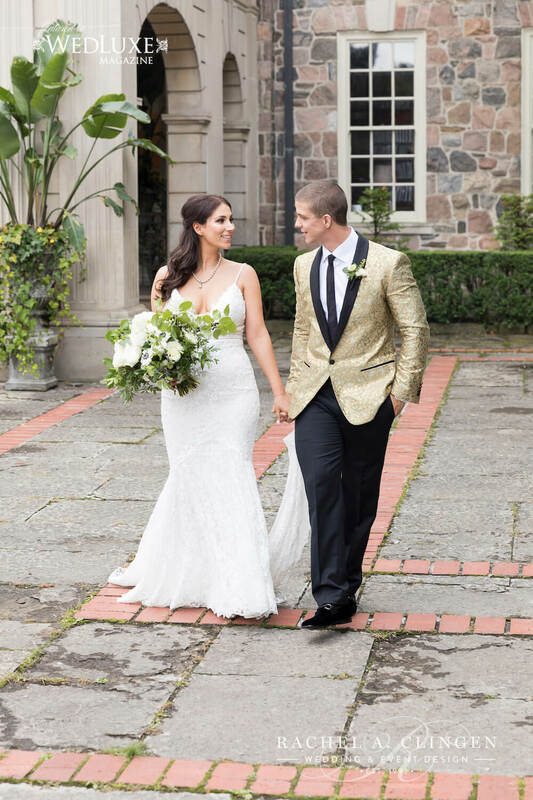 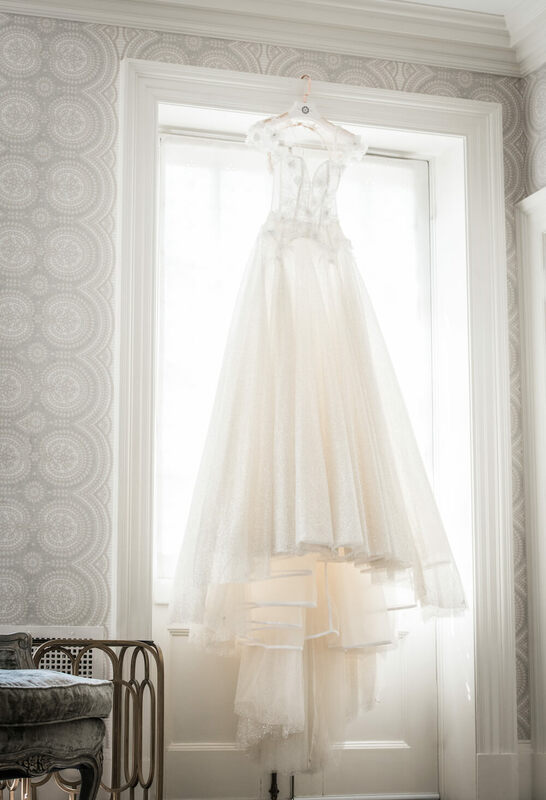 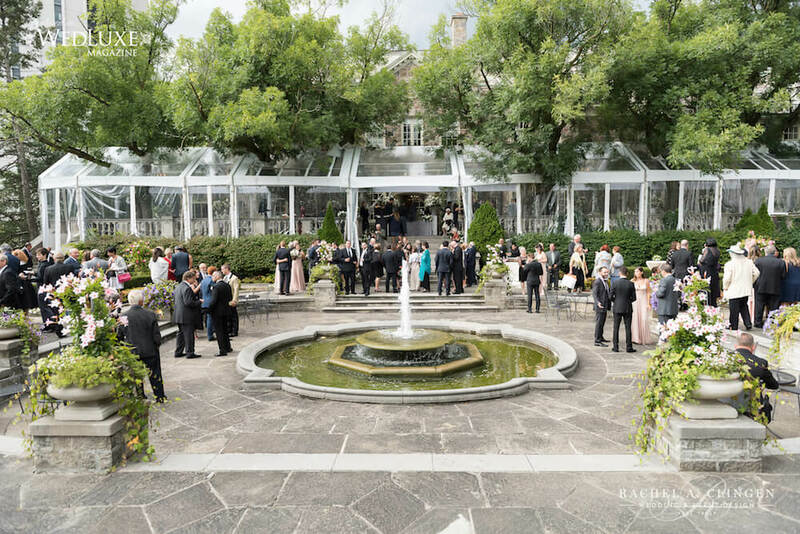 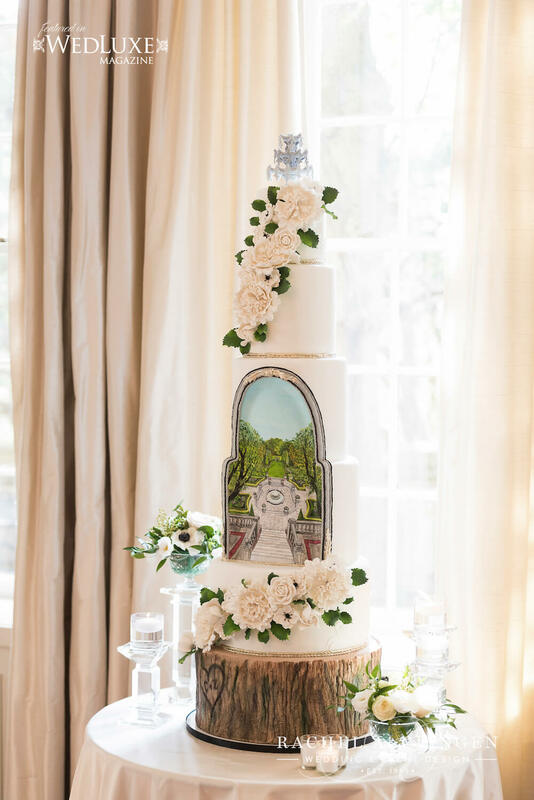 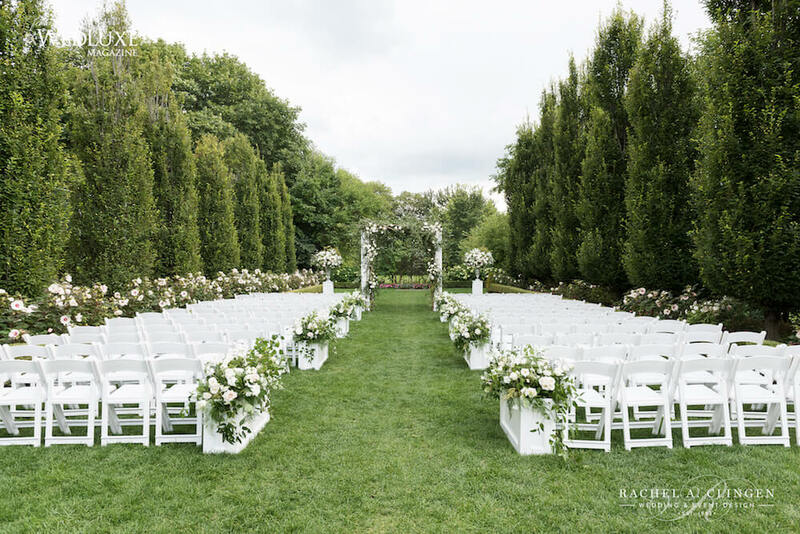 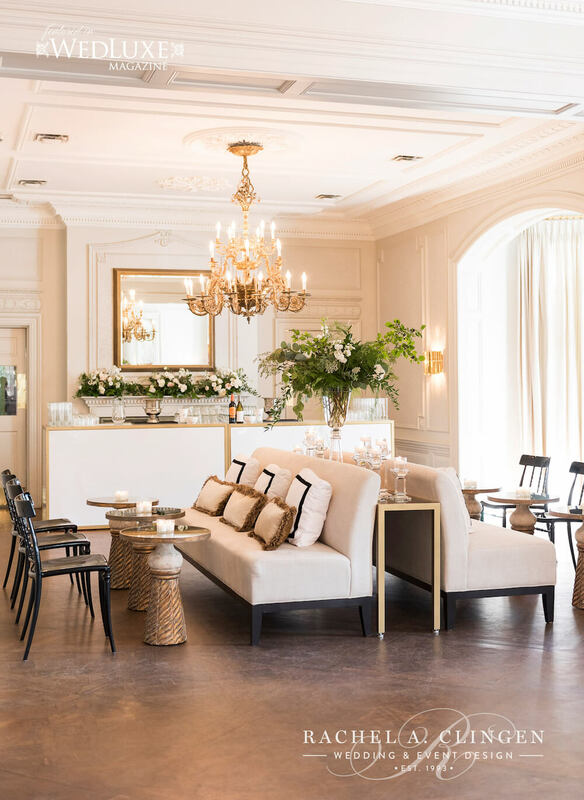 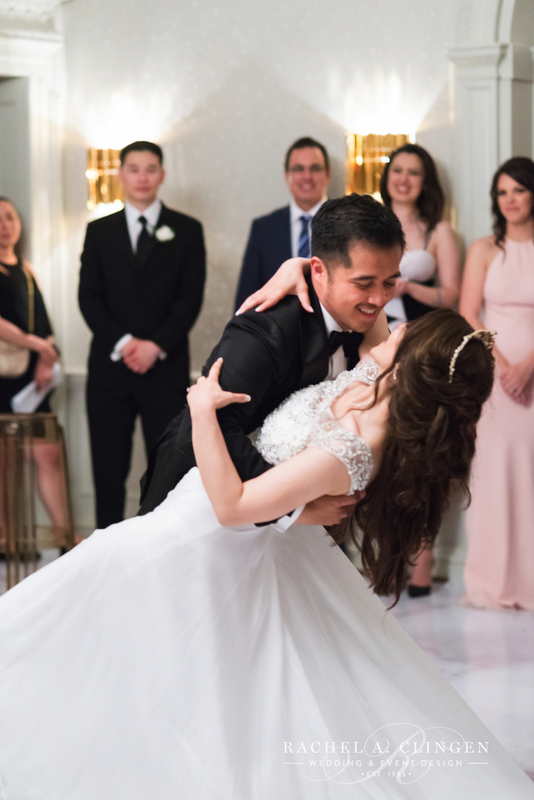 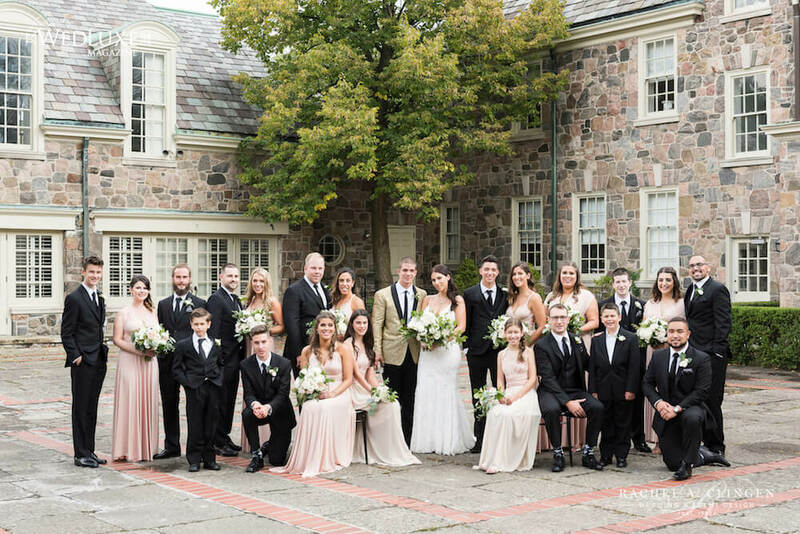 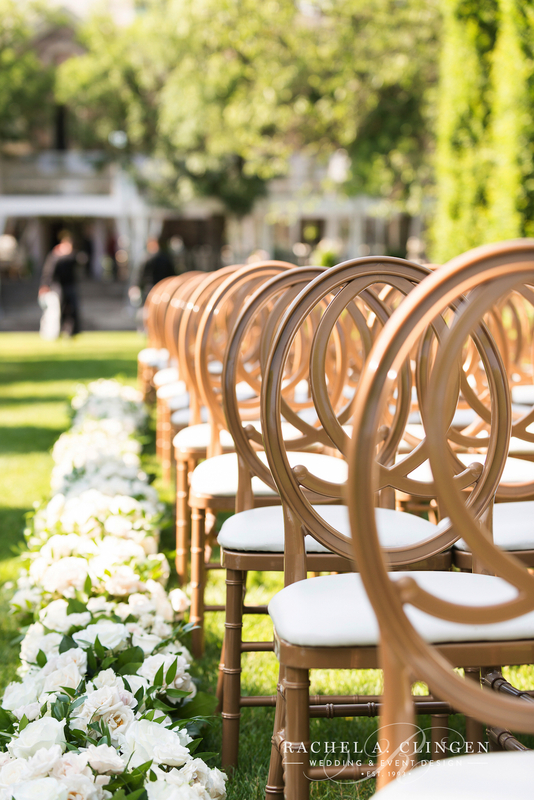 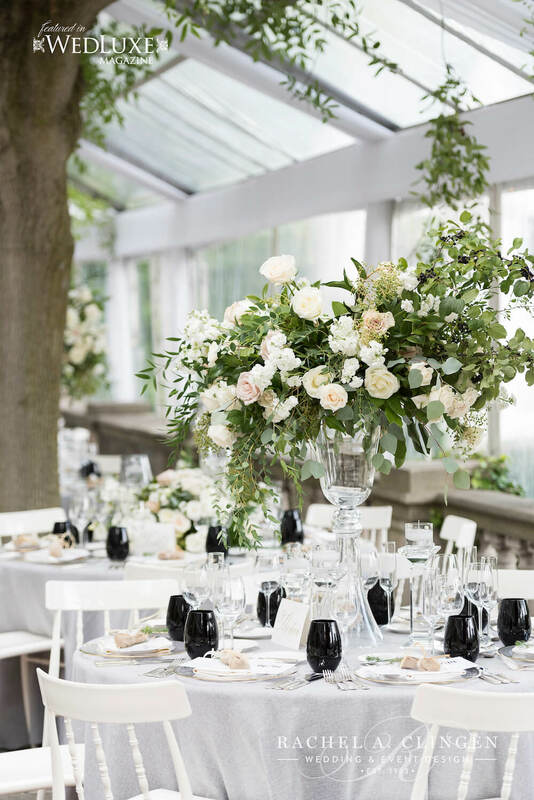 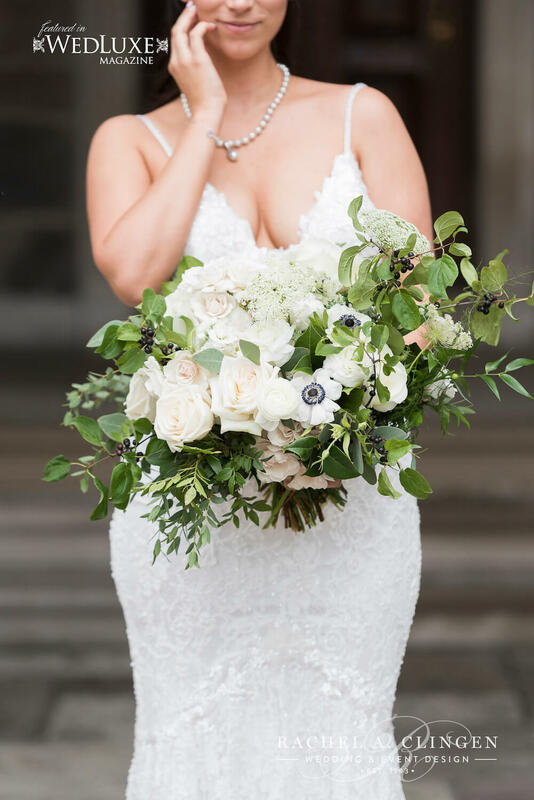 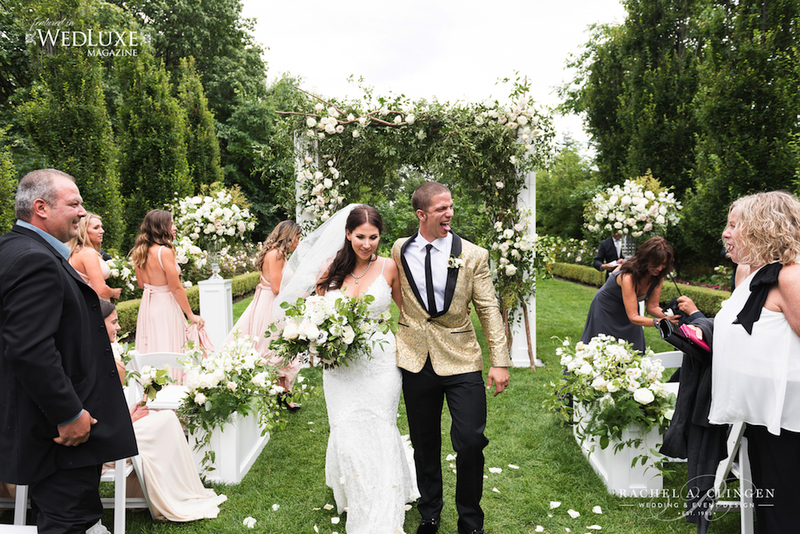 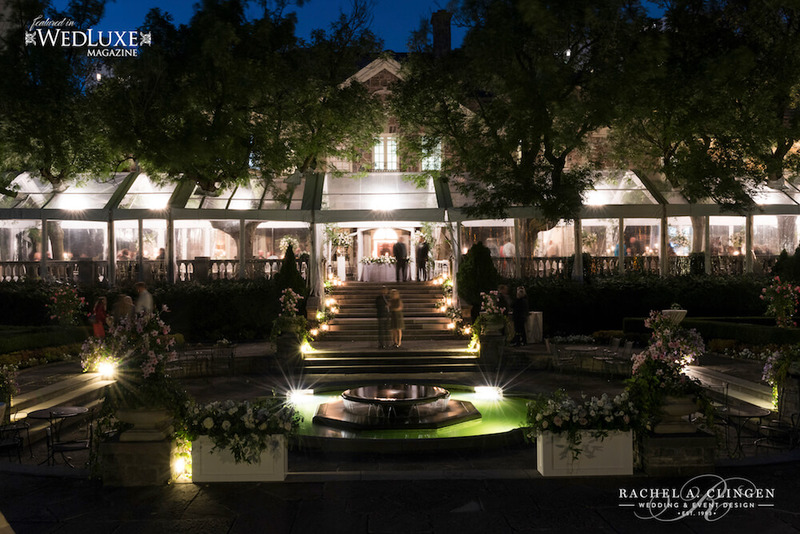 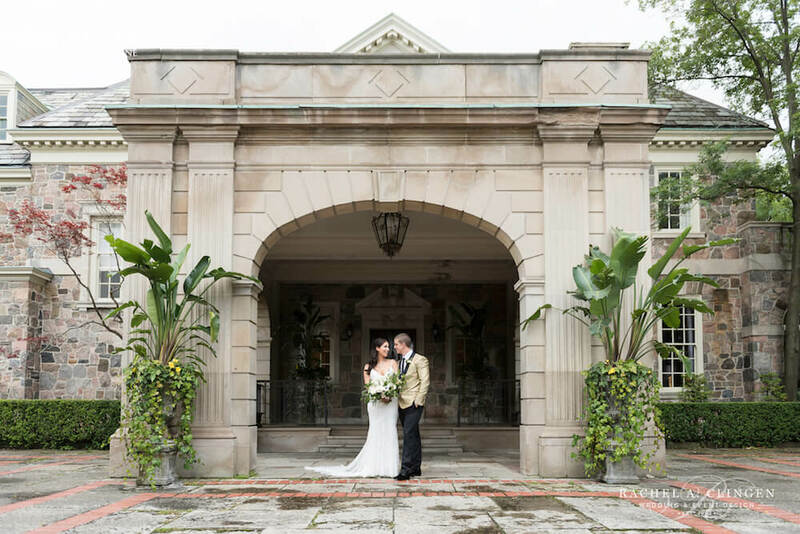 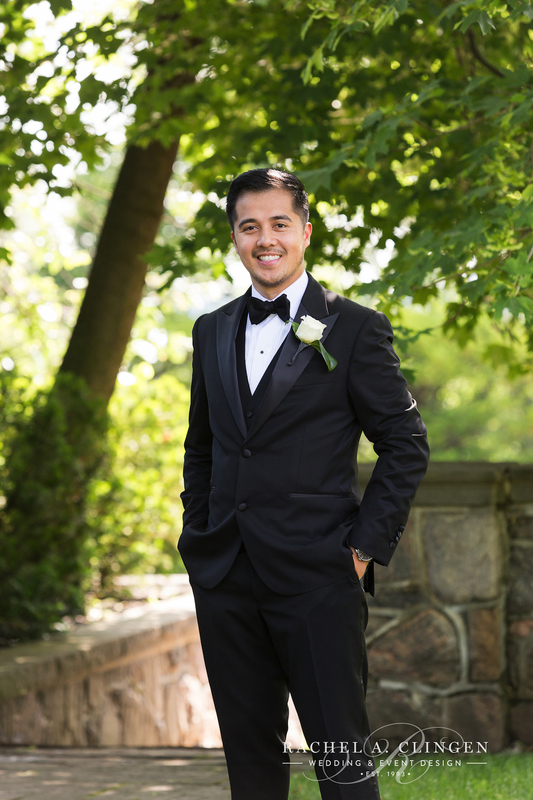 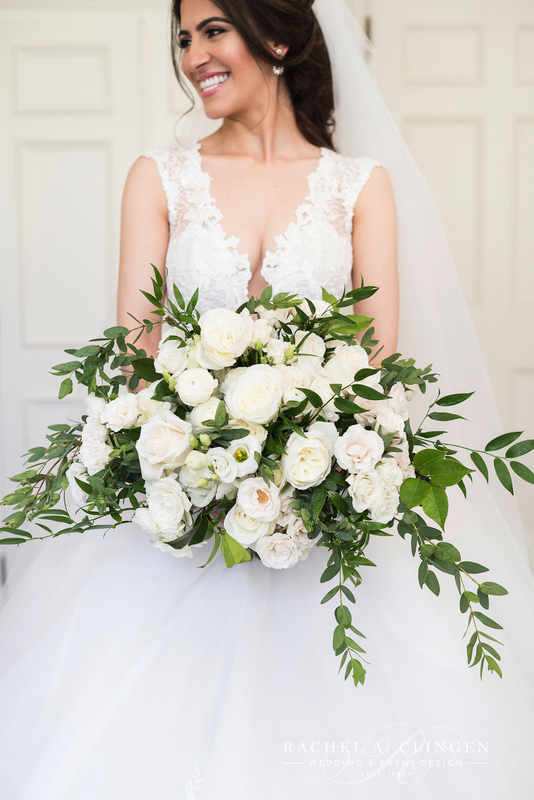 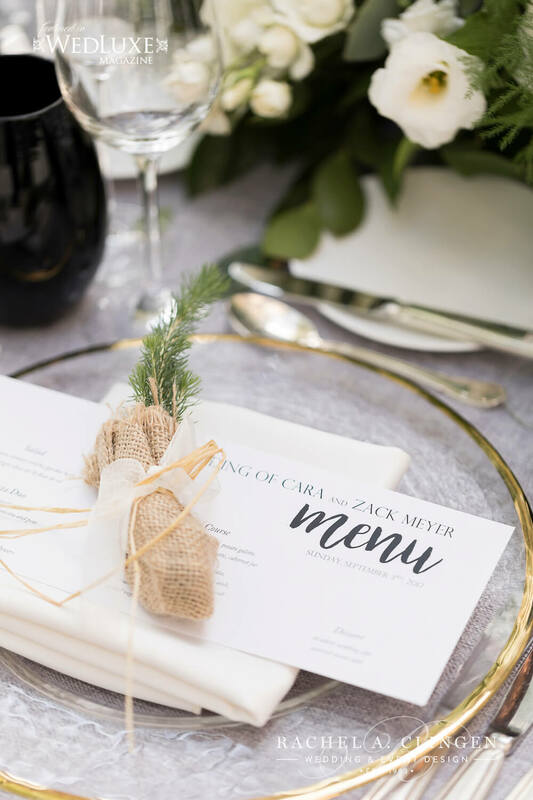 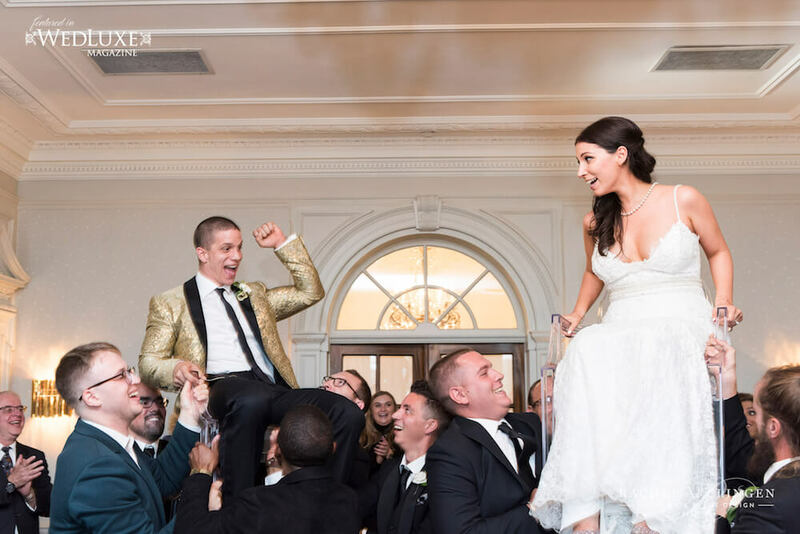 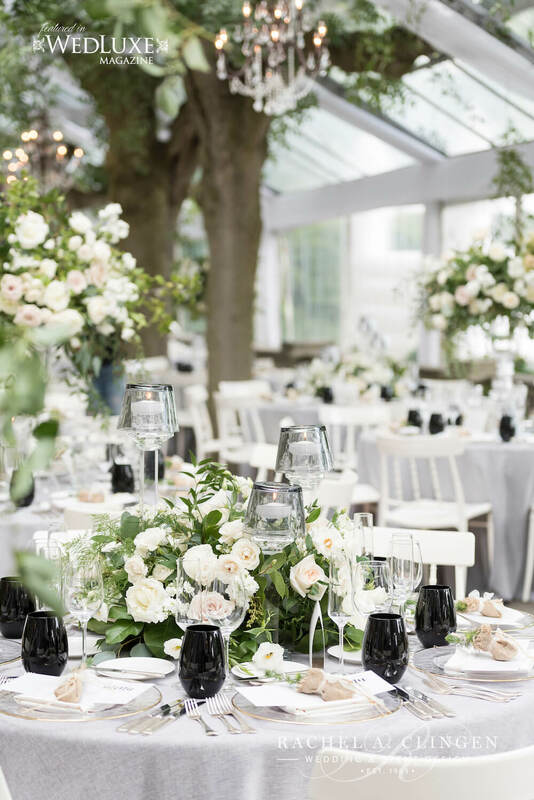 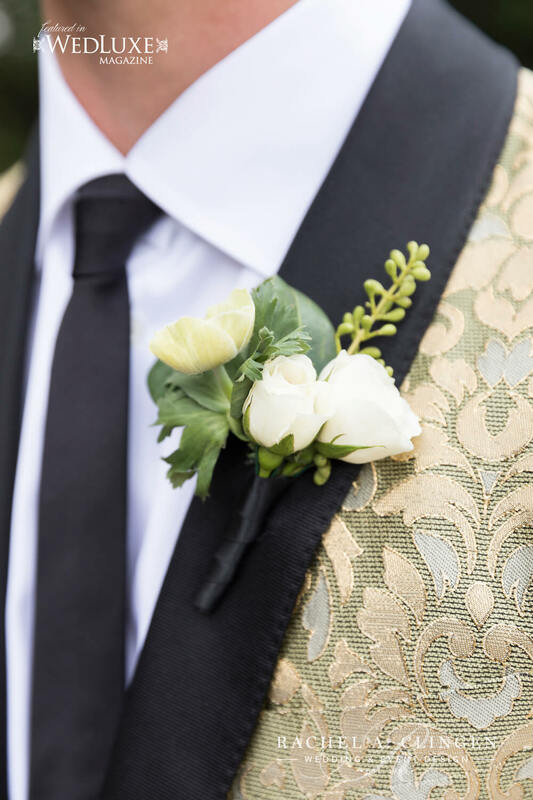 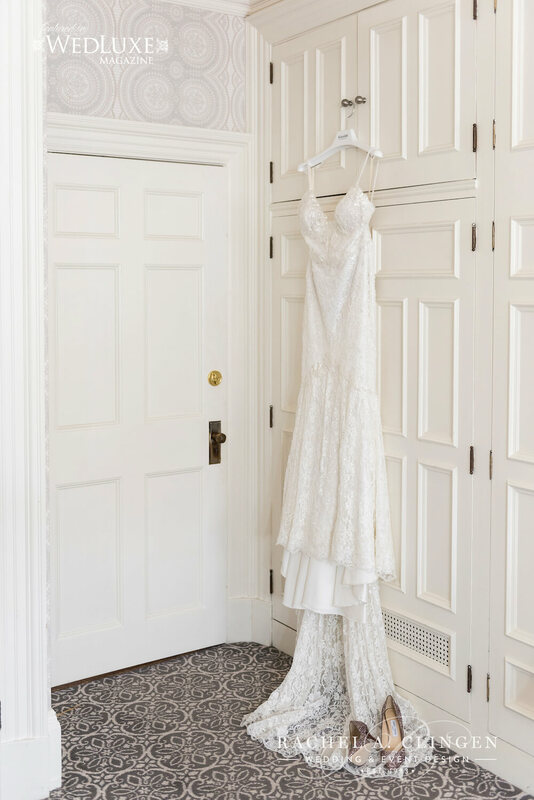 Zack and Cara’s beautiful garden wedding at one of our favourite wedding venues, Graydon Hall, in Toronto was designed to incorporate both the brides love of organic greens and the grooms love for modern accents. 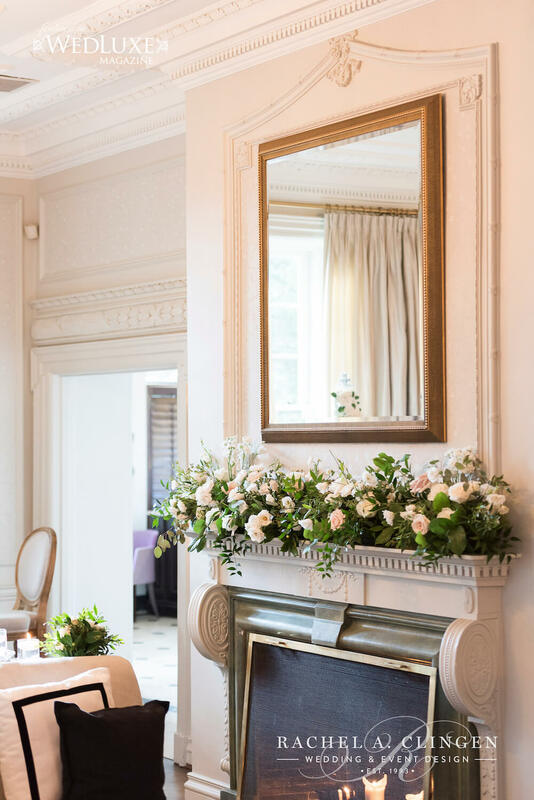 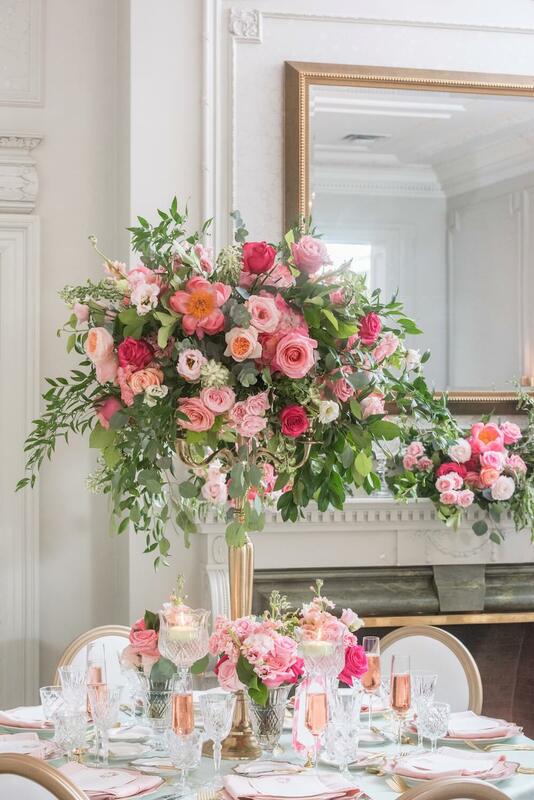 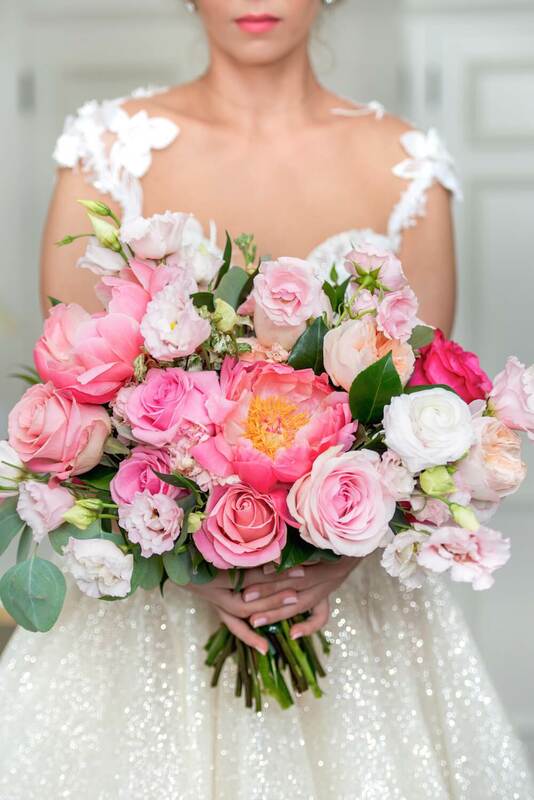 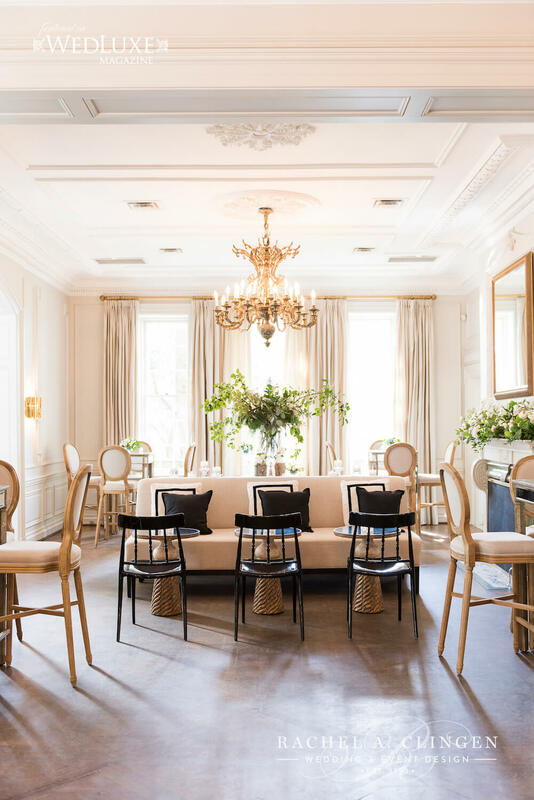 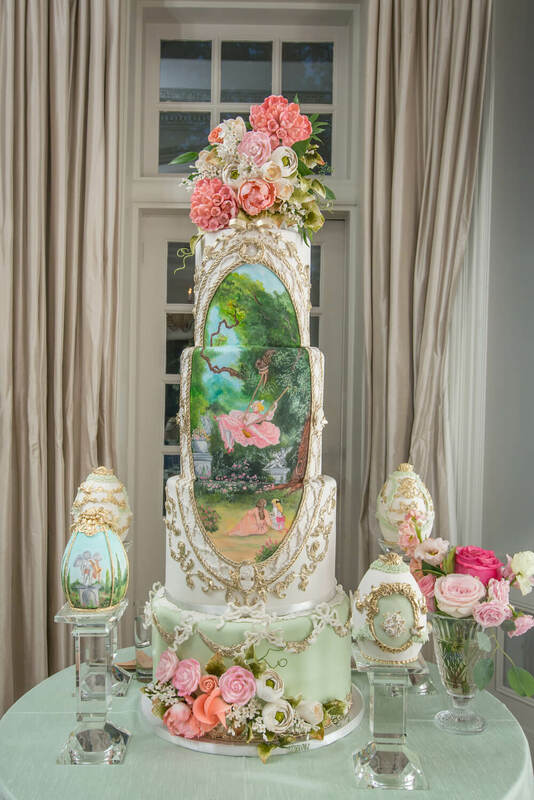 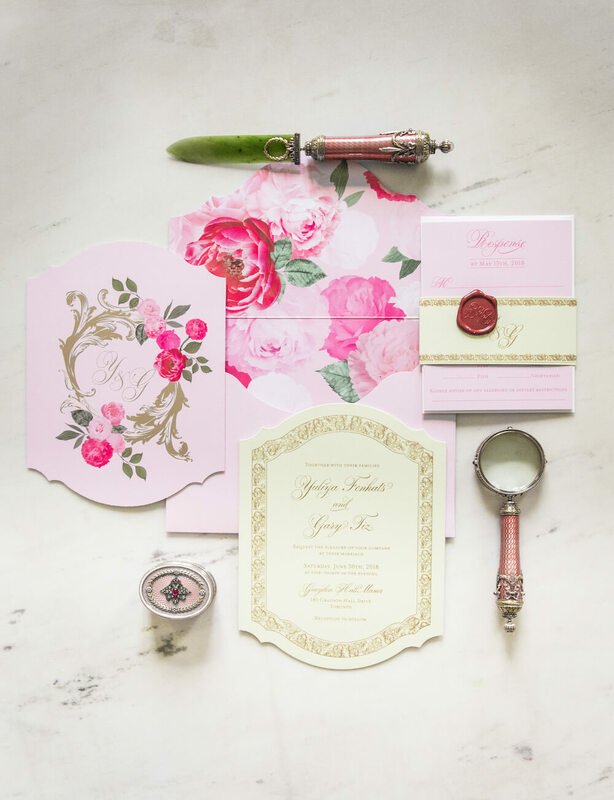 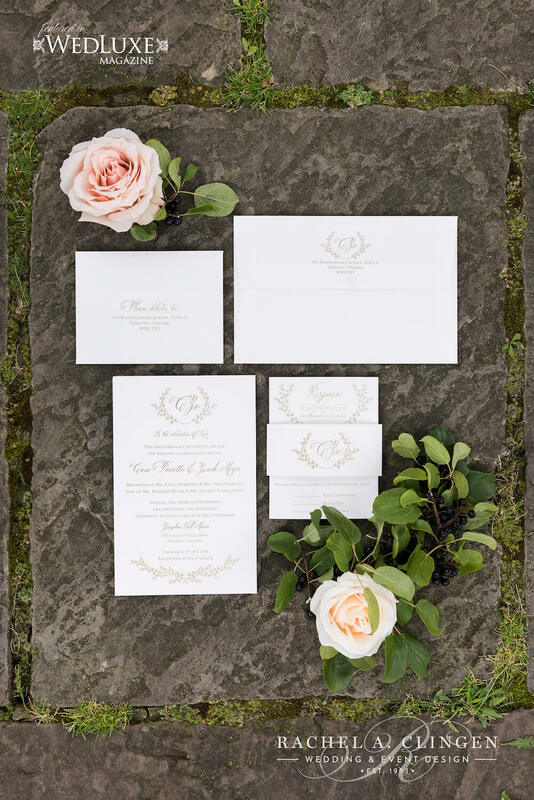 I loved our design meetings together, as well as the challenge to blend and balance these two styles and their personalities in the decor and flowers. 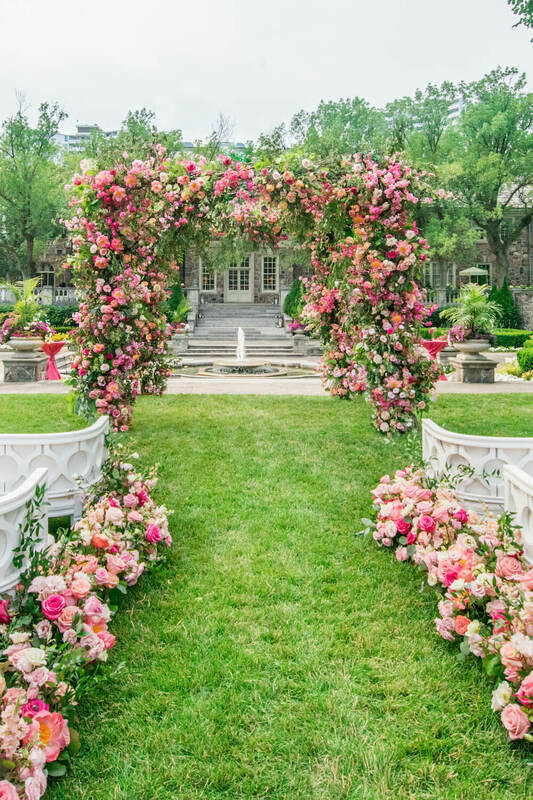 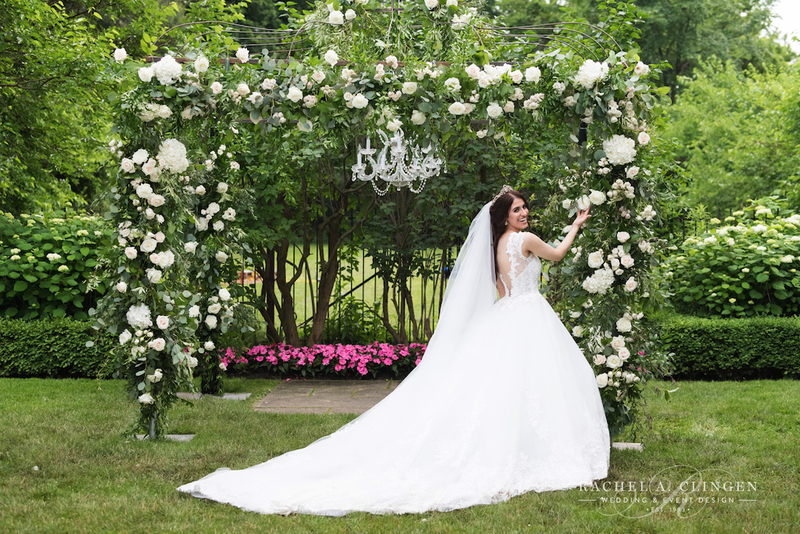 Our team created a gorgeous chuppah that was meant to look a like a garden structure that had been over grown with flowers. 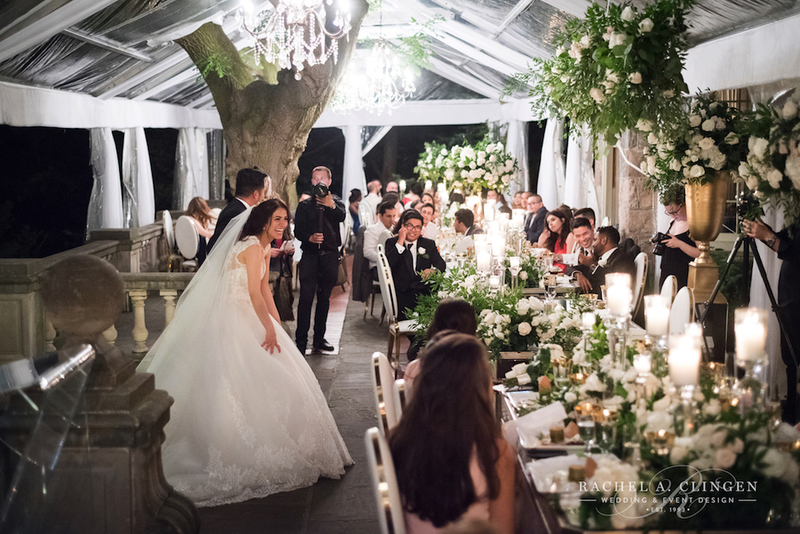 Guests dined on the terrace under a clear top tent. 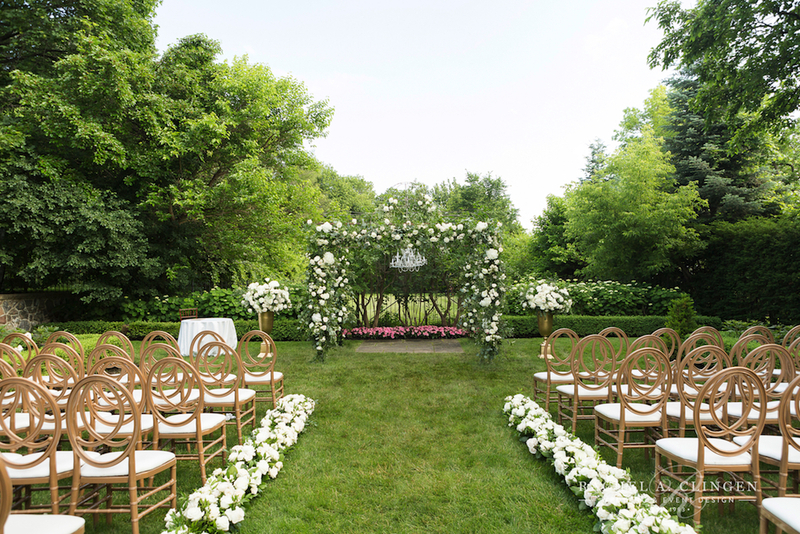 To keep the look organic for Cara, garden vines and trailing greens detailed the canopy. 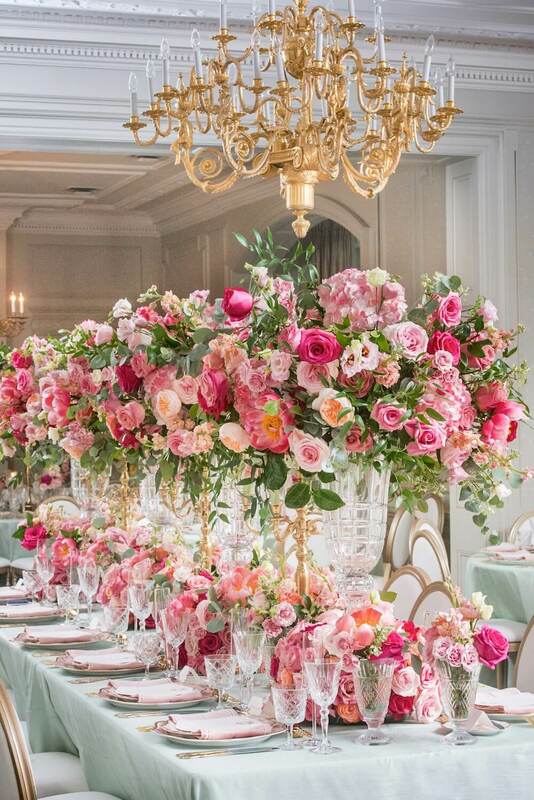 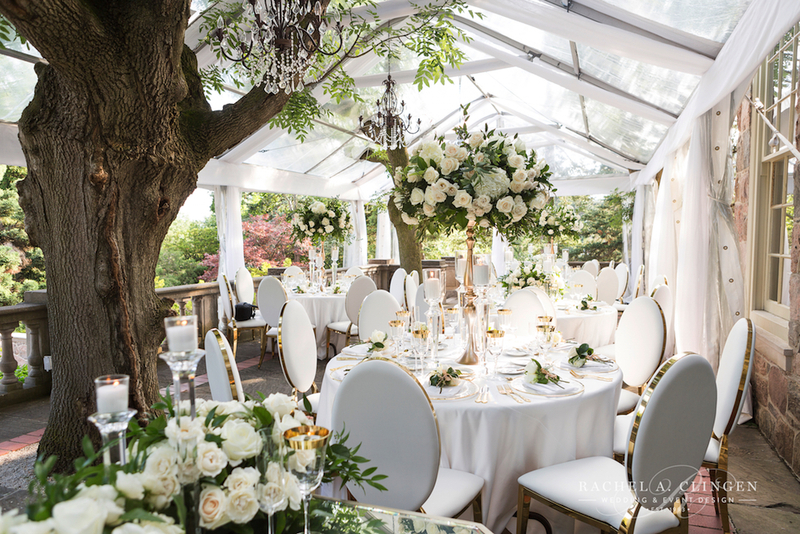 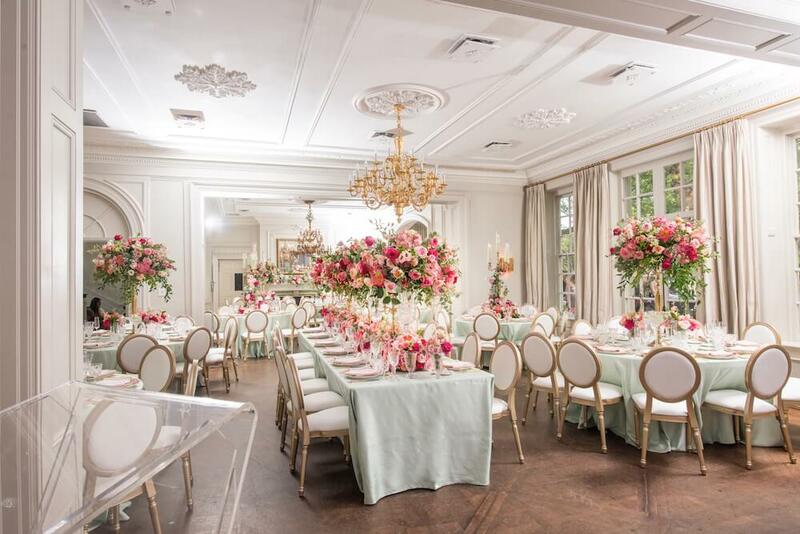 Guest tables were detailed with cascading flowers in crystal vessels. 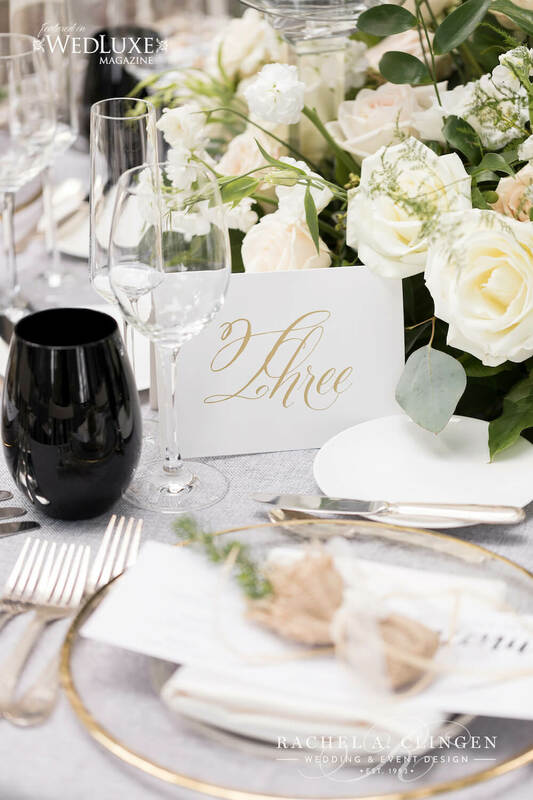 We brought in an element of modern sophistication by adding a pop of black in the water goblets and in the lounge area. 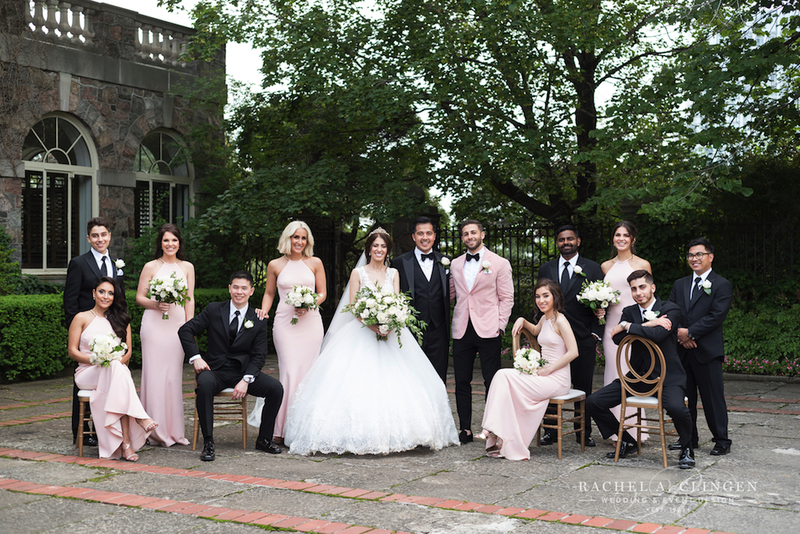 Congratulatons Zack and Cara! 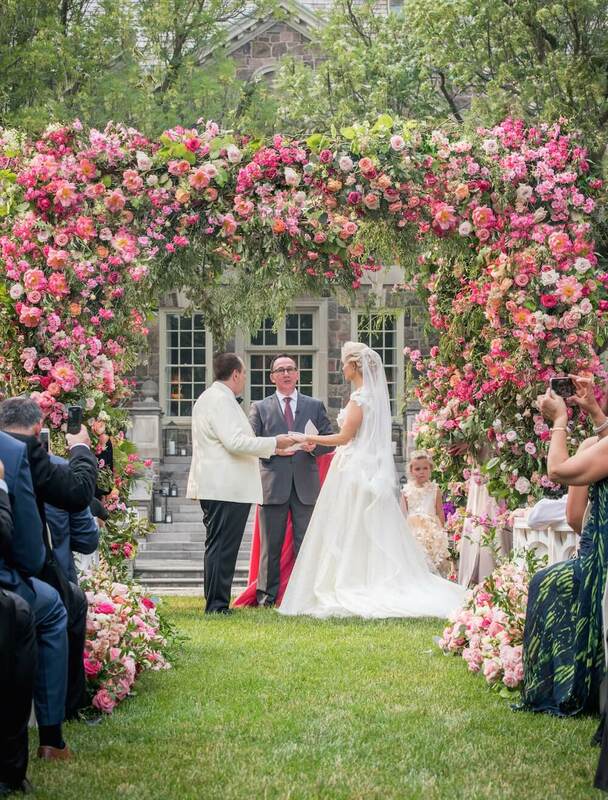 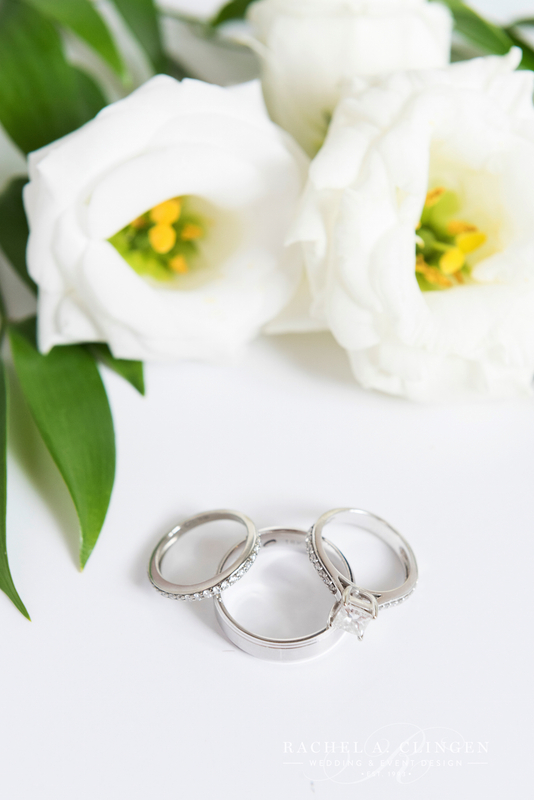 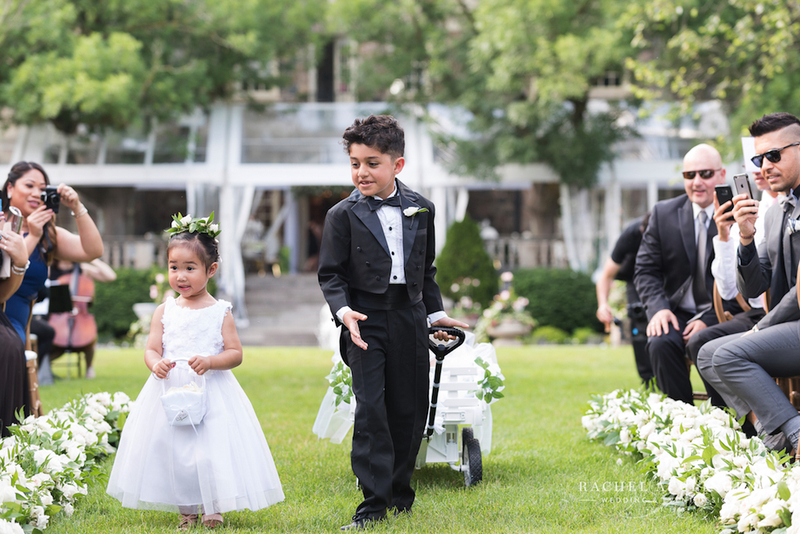 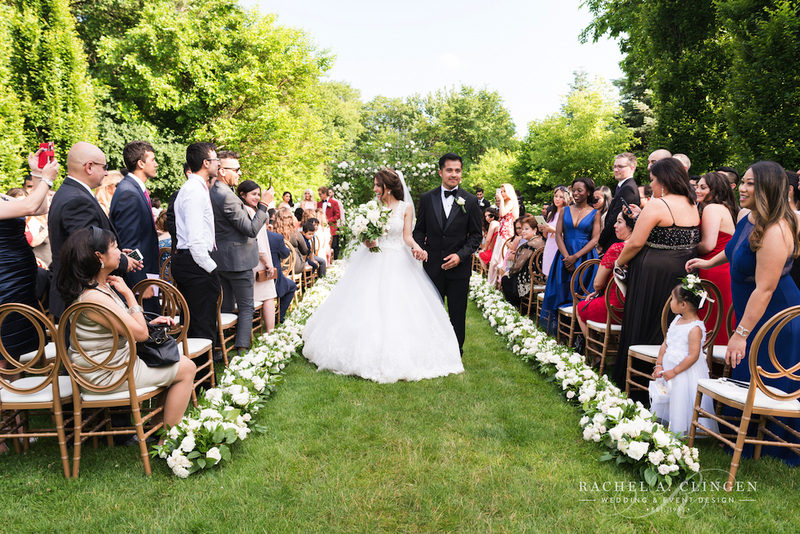 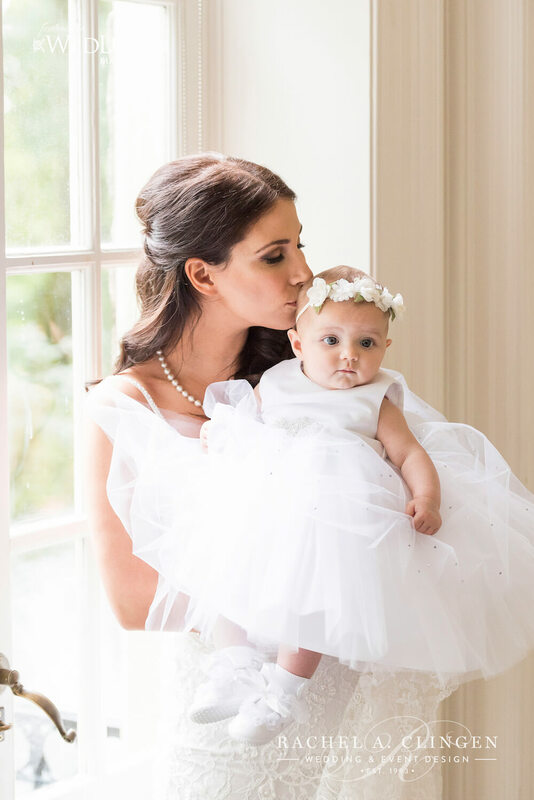 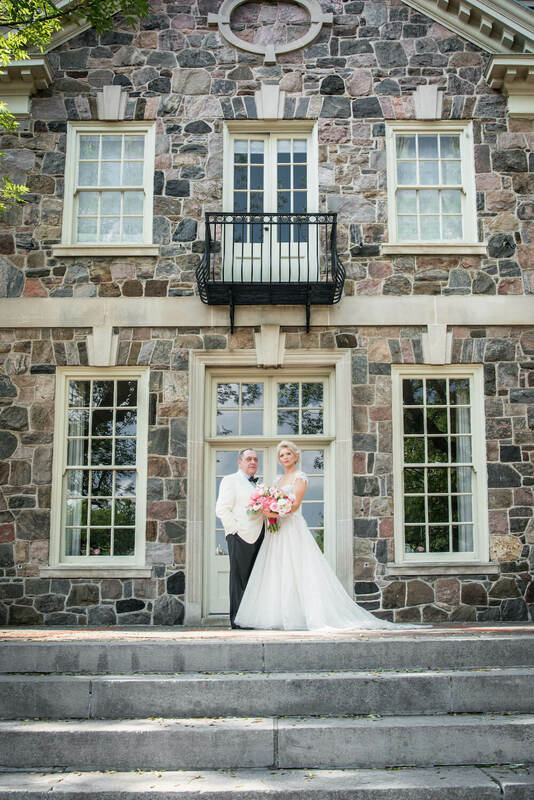 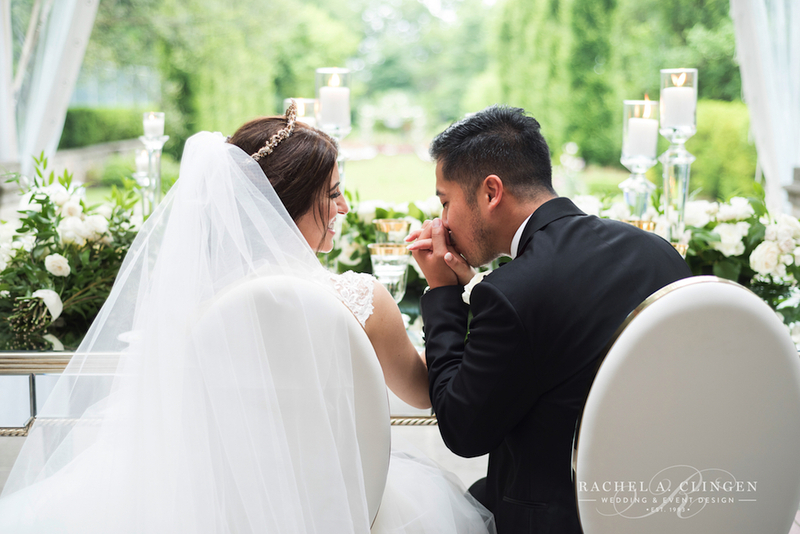 There’s just something about a garden wedding and Shadi and Johns beautiful summer wedding at Graydon Hall was picture perfect! 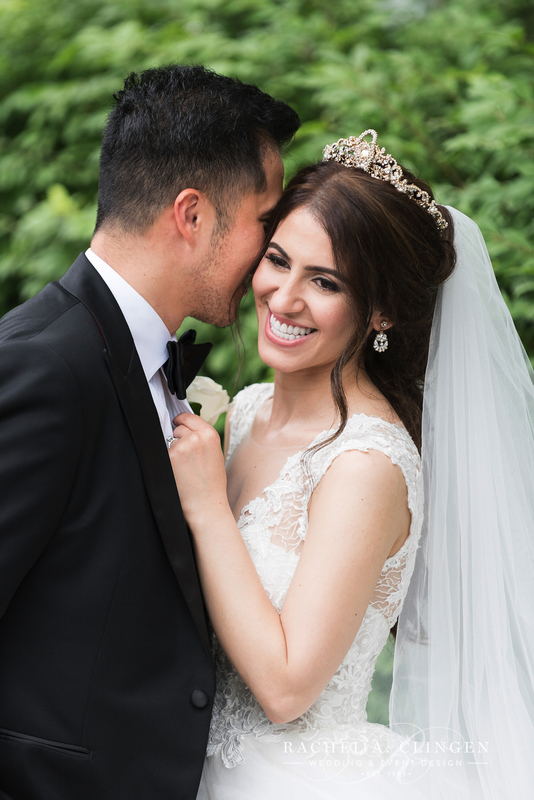 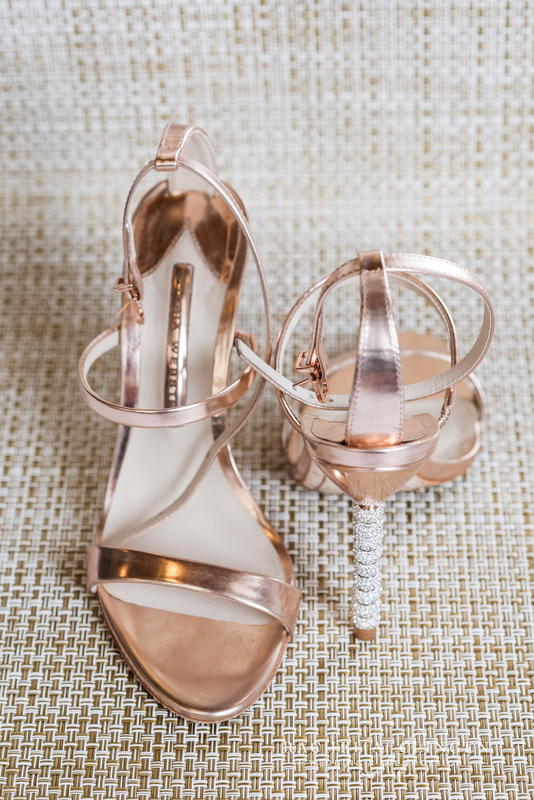 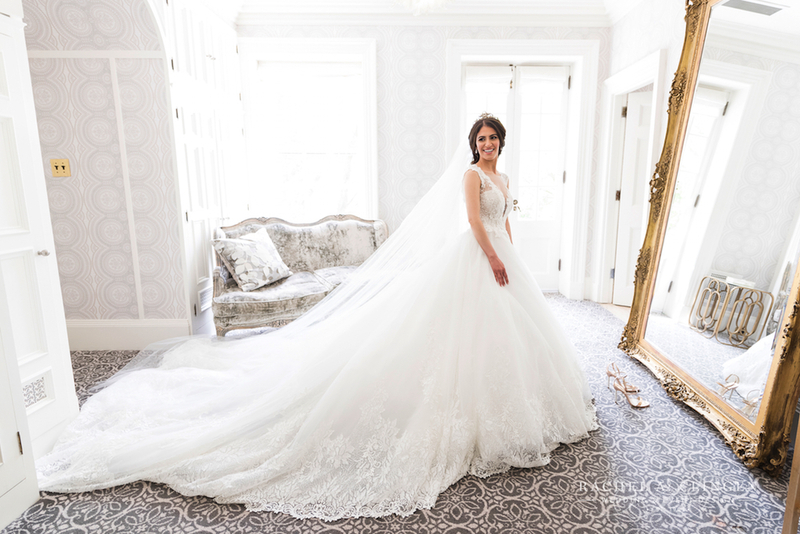 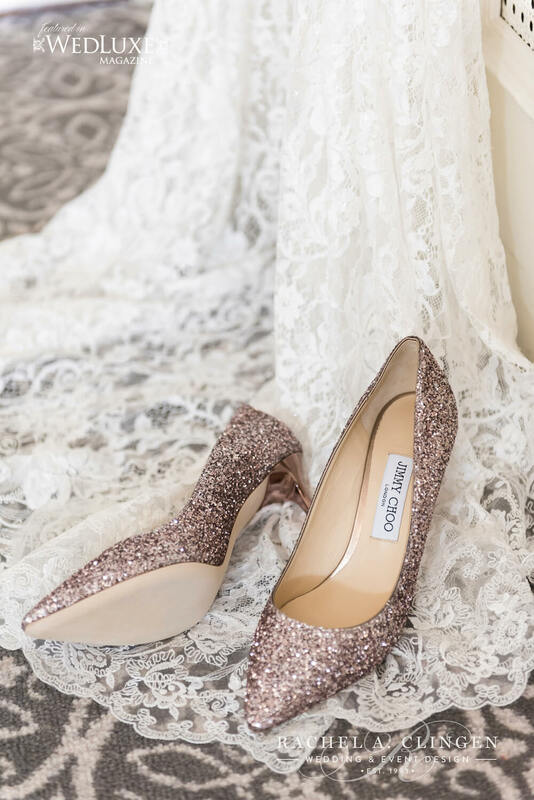 Gorgeous Shadi dreamt of a fairtale wedding, enchanting, elegant and full of memories to last a life time. 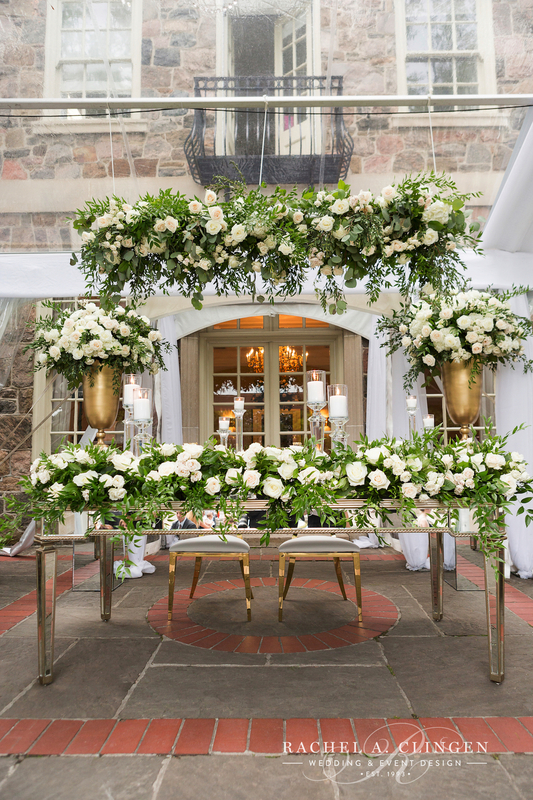 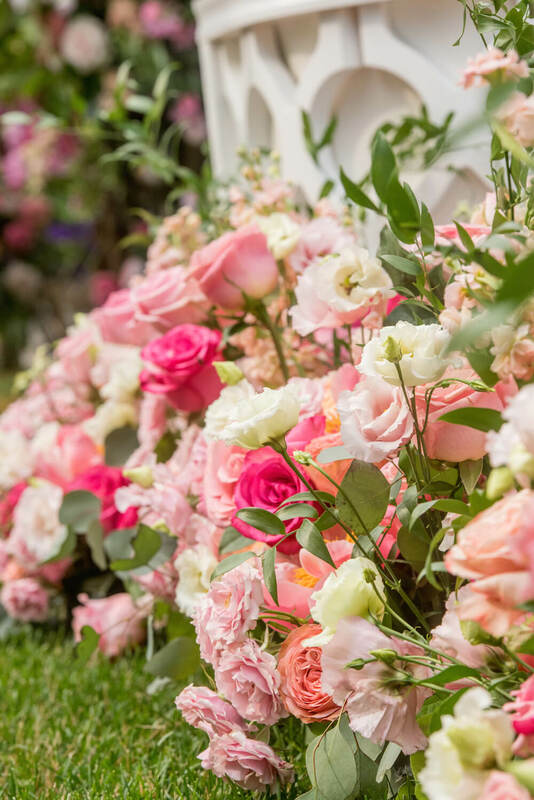 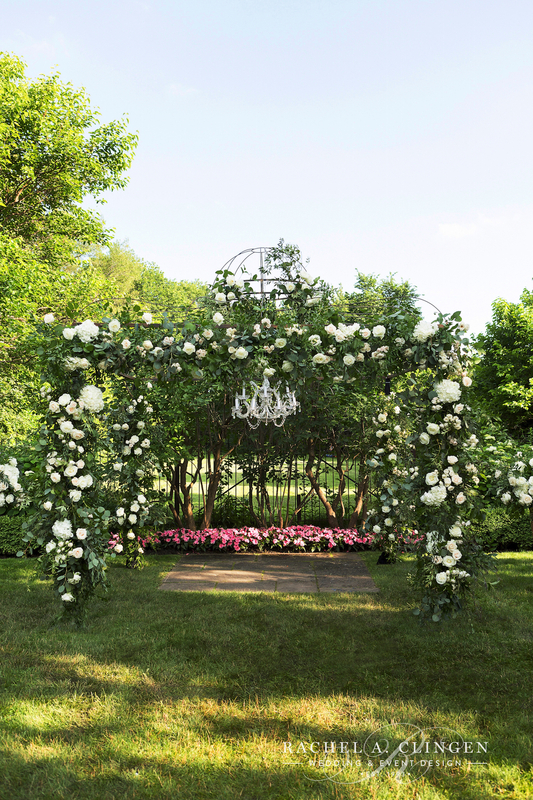 Our team designed the most stunning floral canopy, loaded with garden roses, hydrangeas, spray roses and fresh mixed foliages. 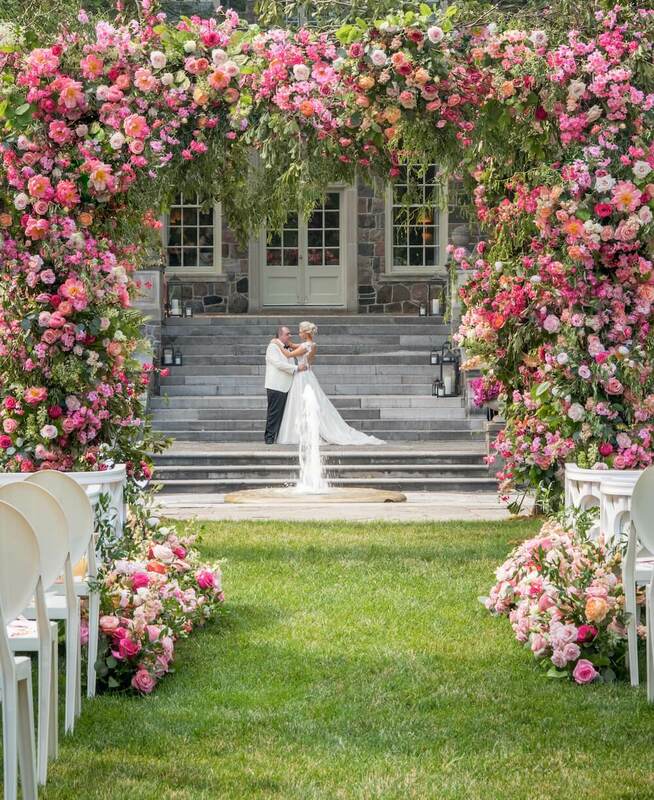 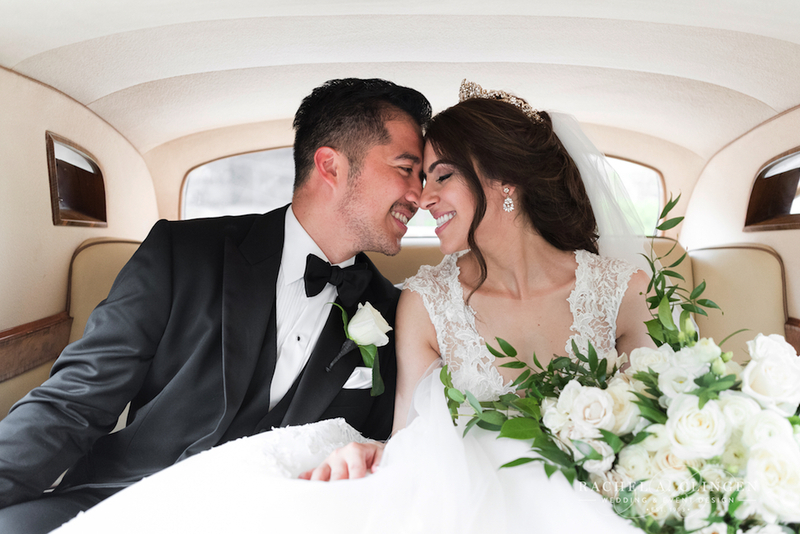 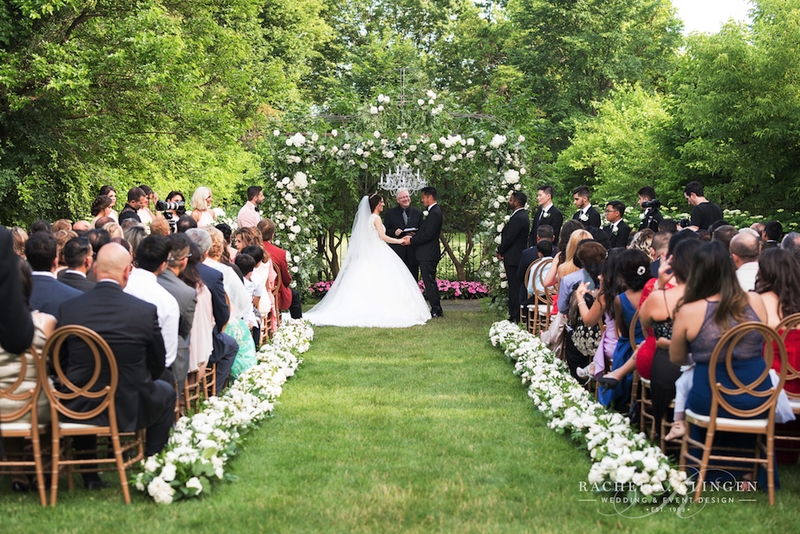 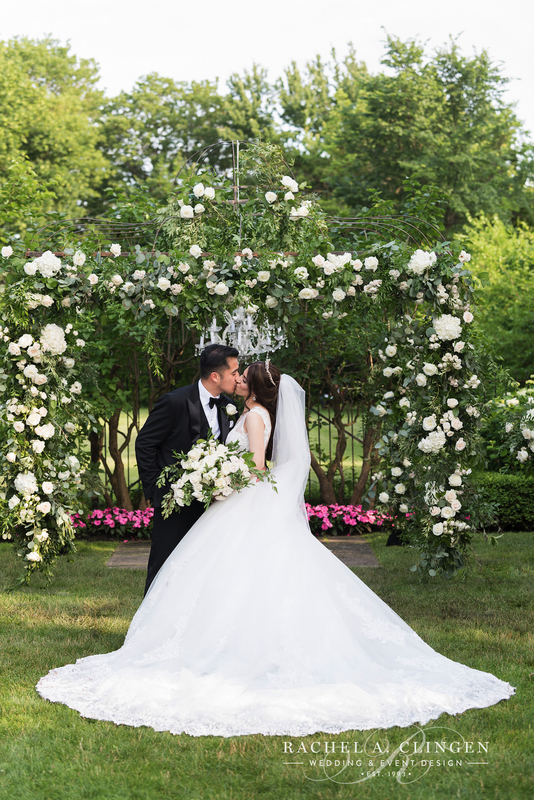 Shadi and John expressed their love one for another under the stunning floral structure. 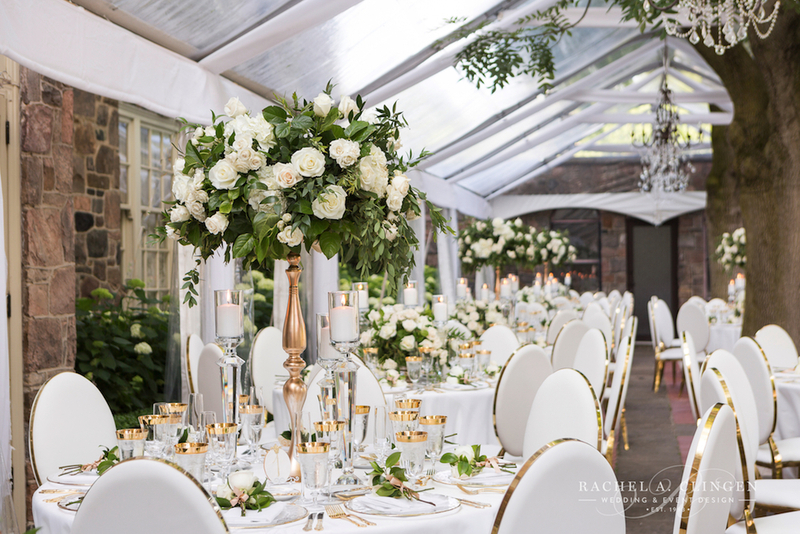 The receptions was held on the terrace under the tent which was detailed the prettiest florals from top to bottom. 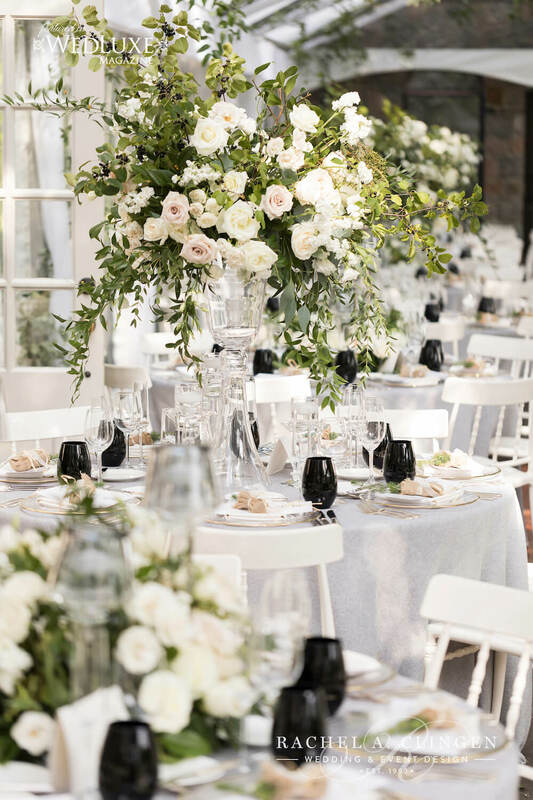 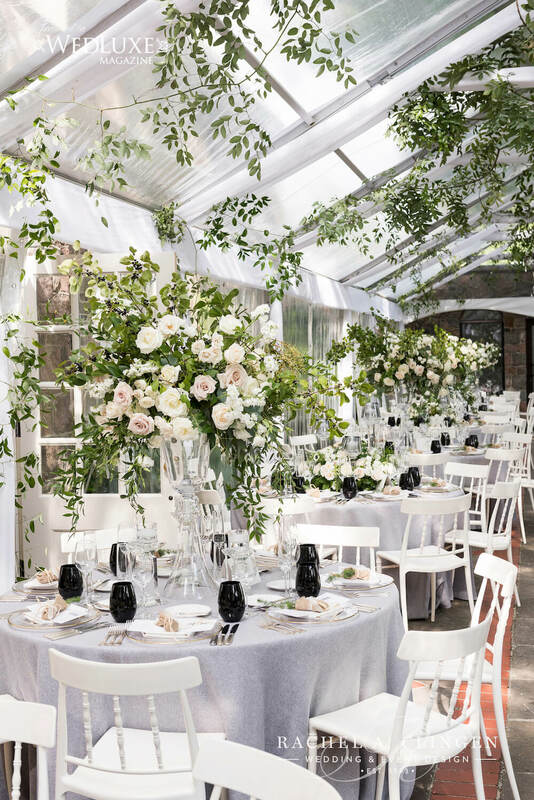 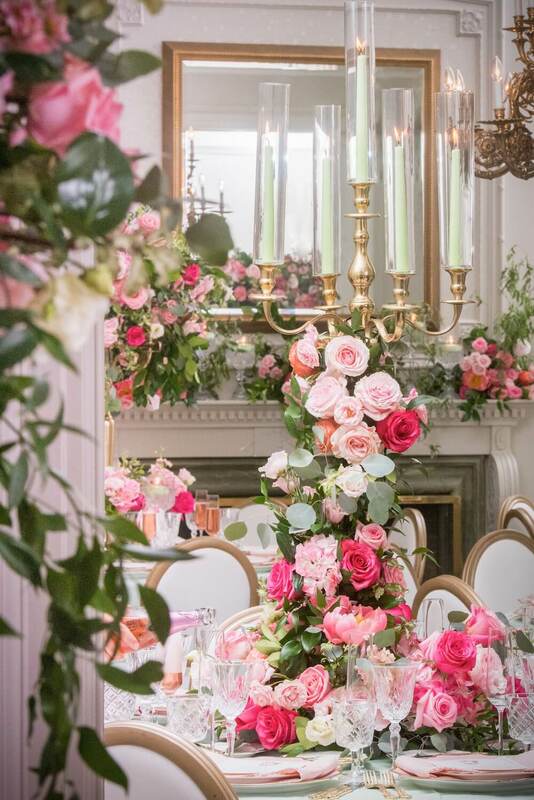 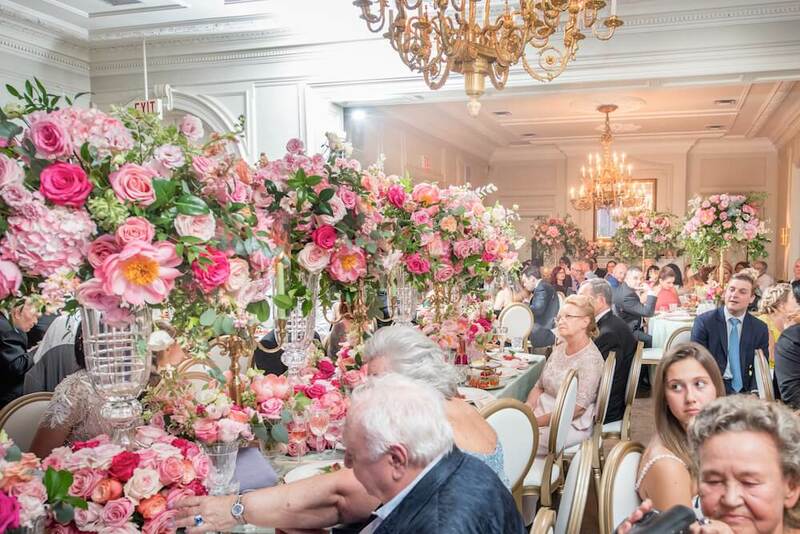 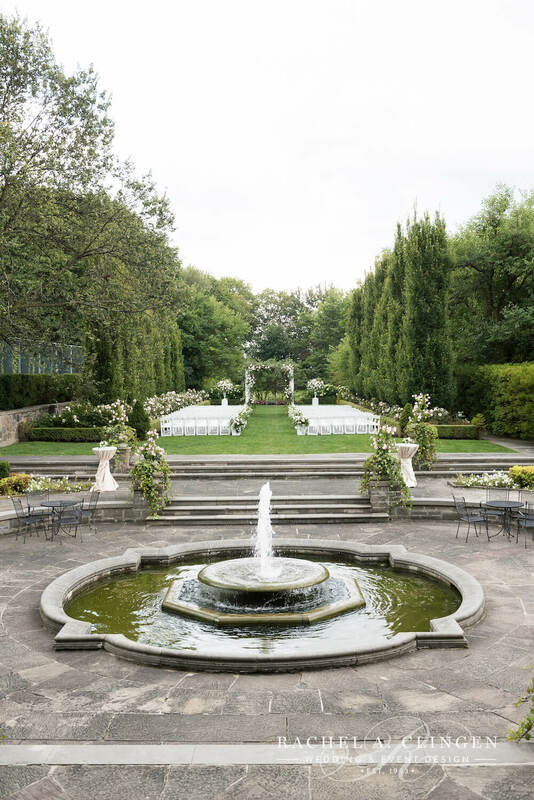 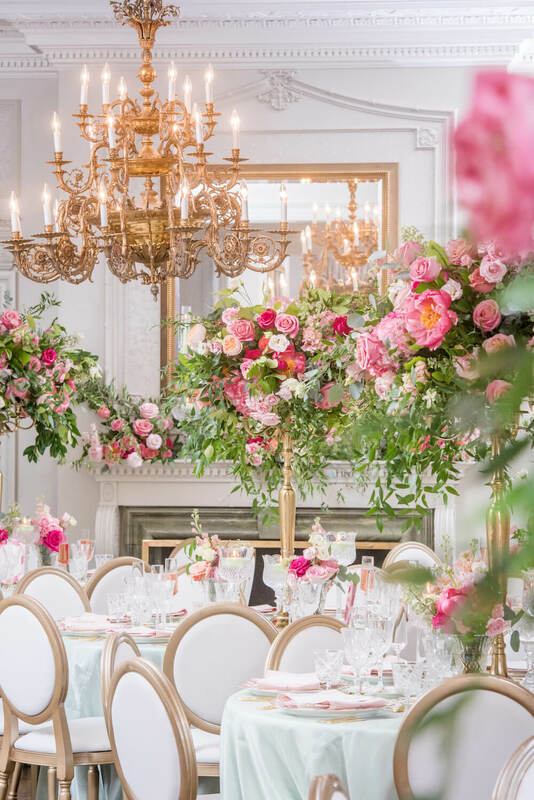 Guests dined at round tables accented with showstopper centrepieces bursting with roses, lysianthus, hydrangeas and a collection of cascading greens. 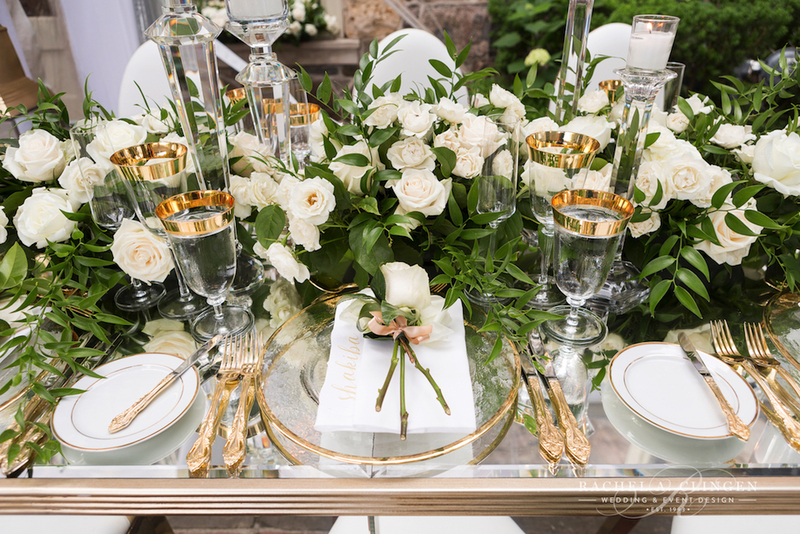 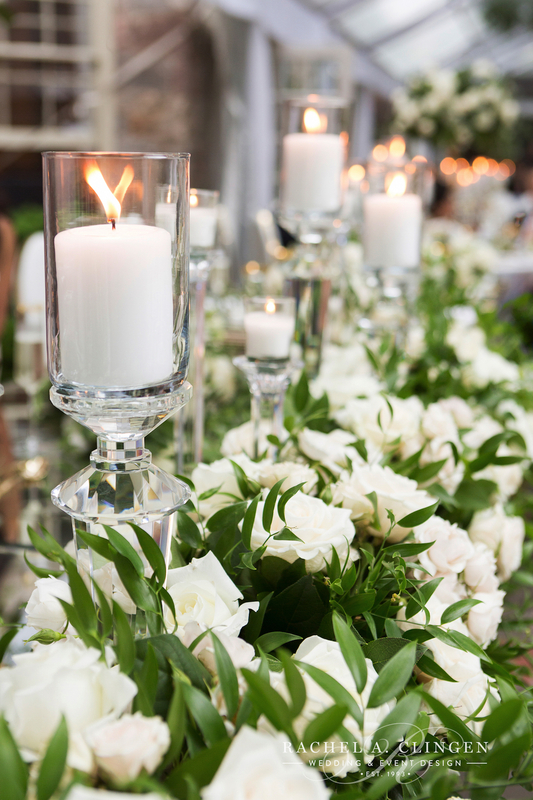 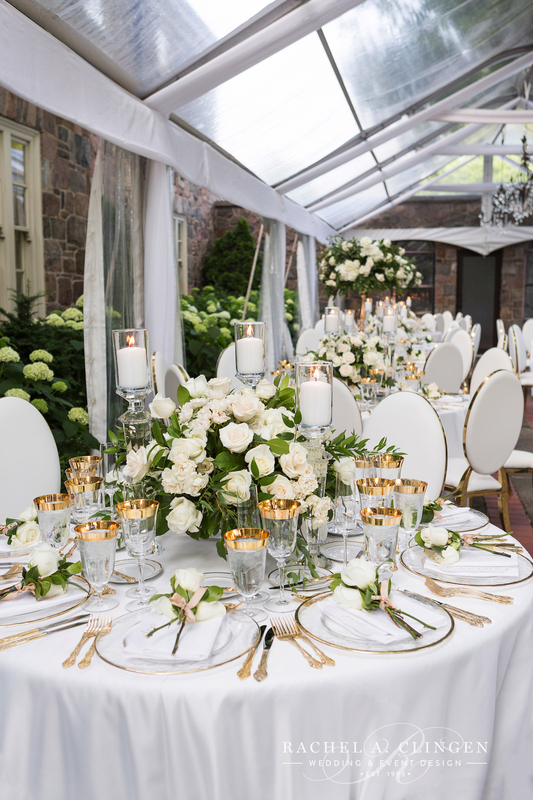 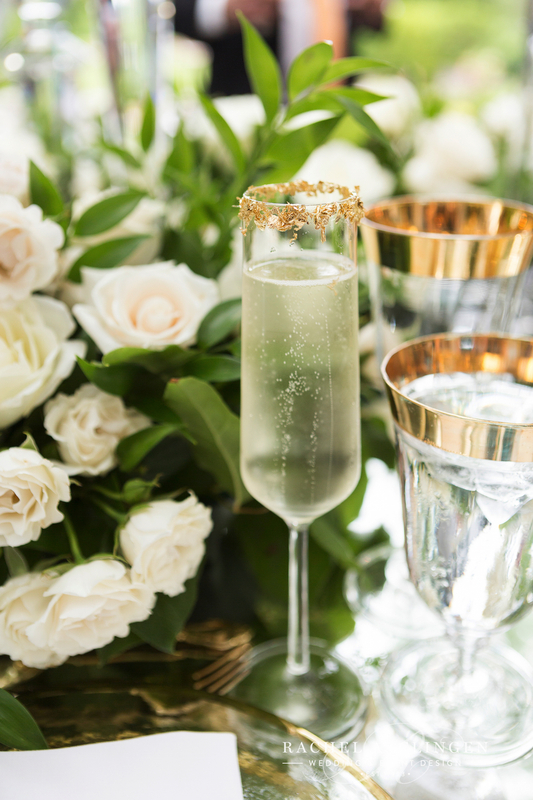 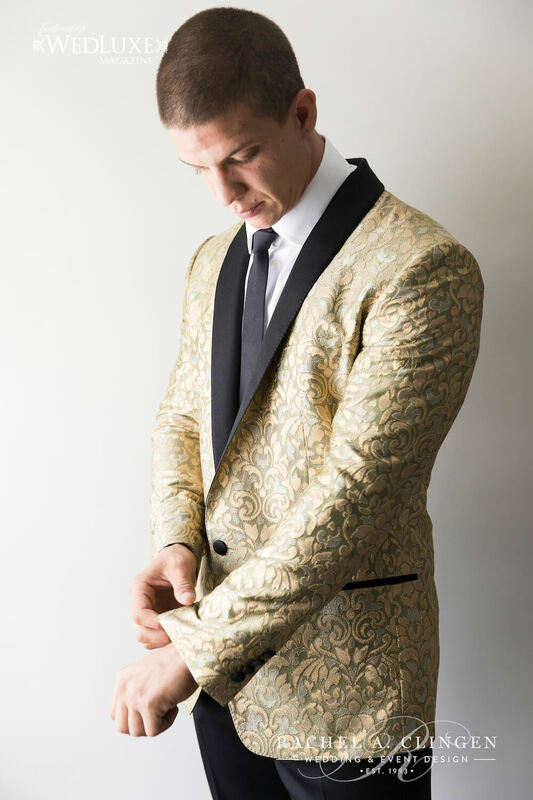 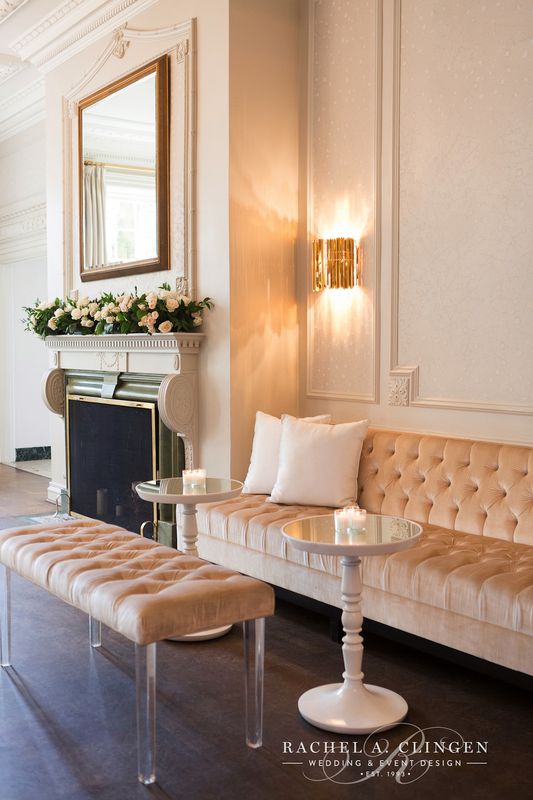 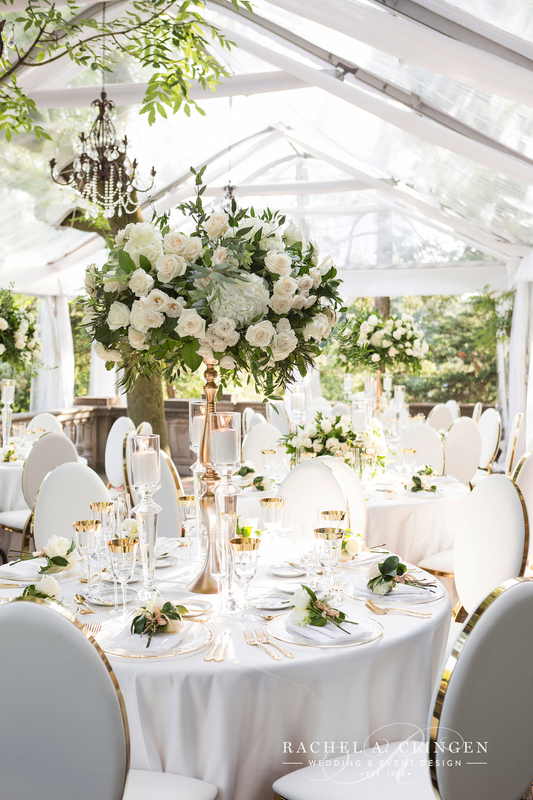 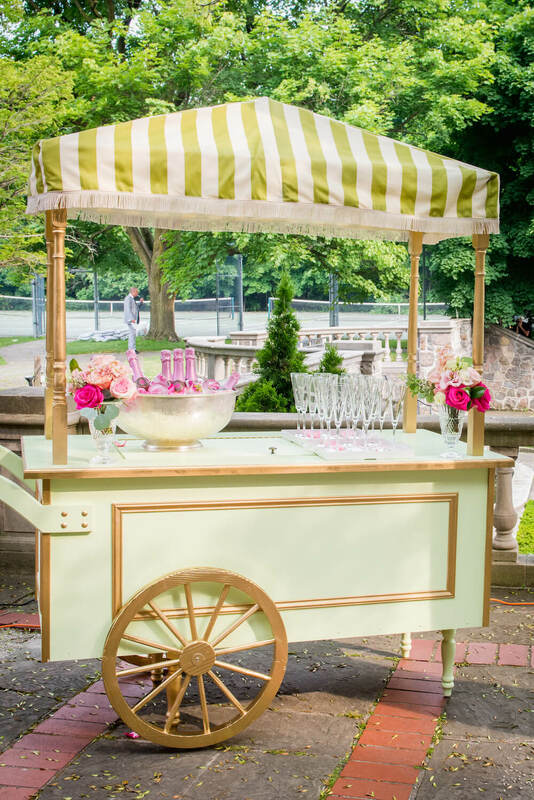 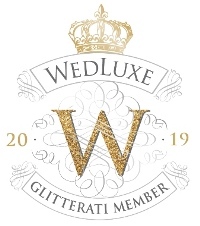 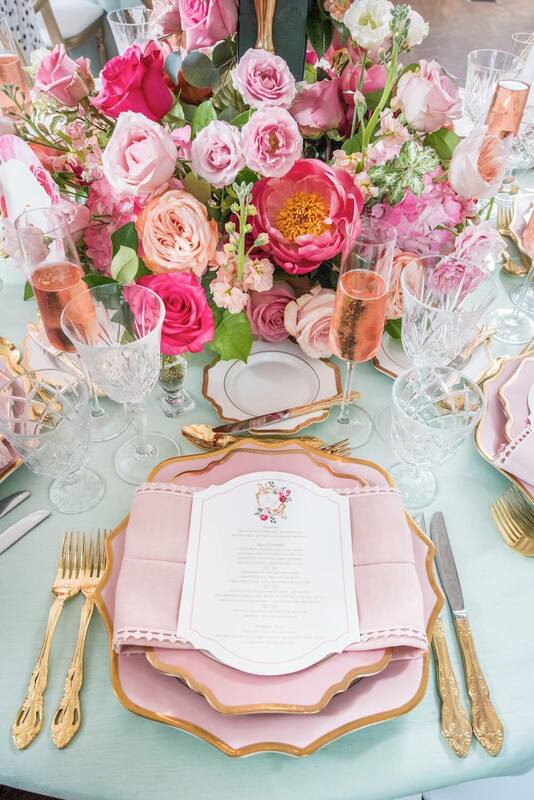 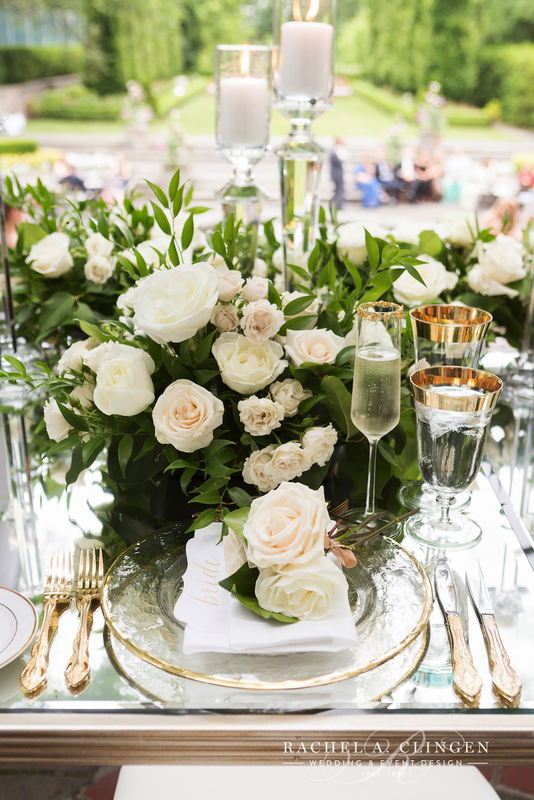 Luxurious decor elements included crystal candle sticks, gold cutlery and gold rimmed stemware. 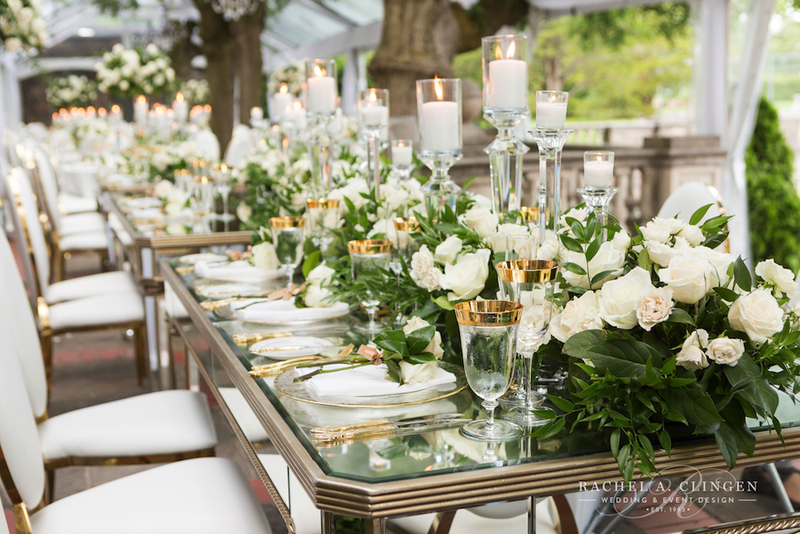 Shady and John dined at a beautiful mirrored table just for two. 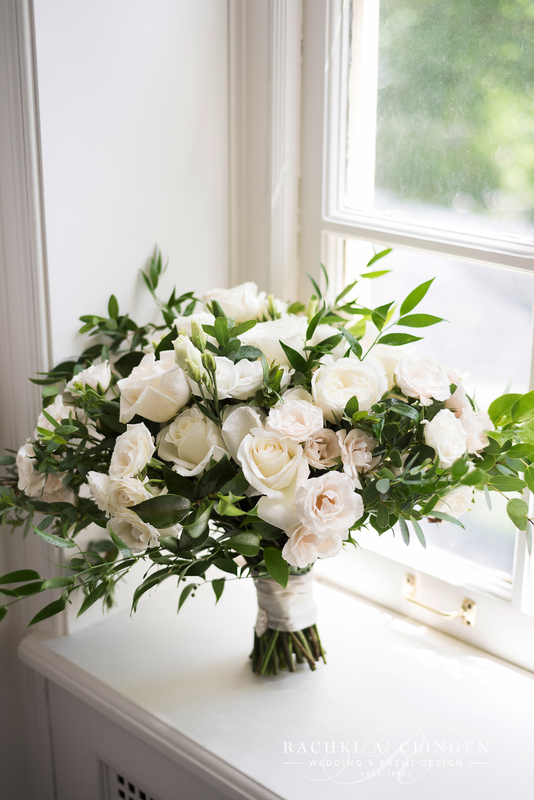 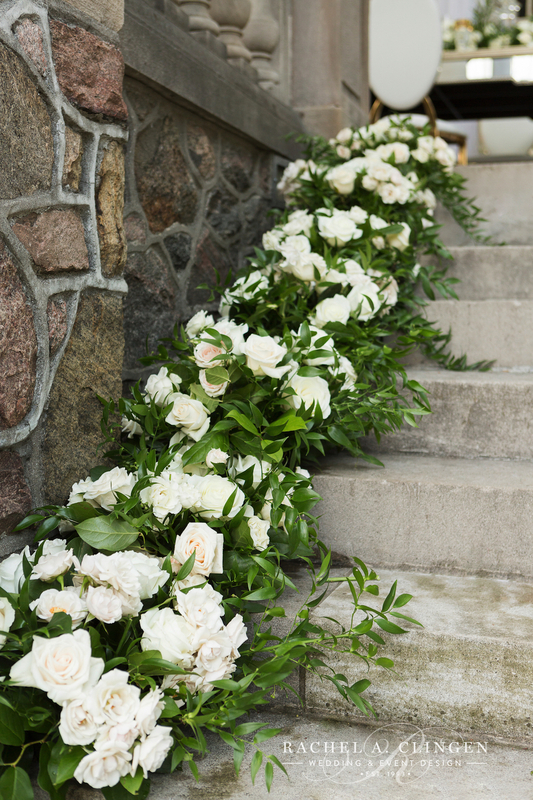 Shady thought of eery detail, including, hand tied flowers for every guest! 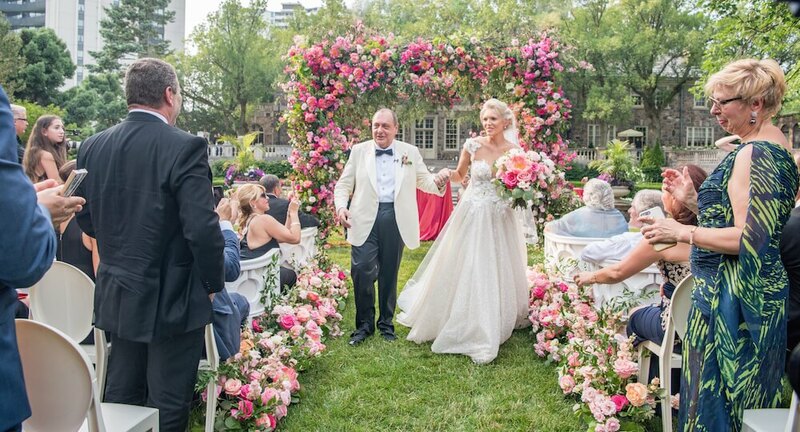 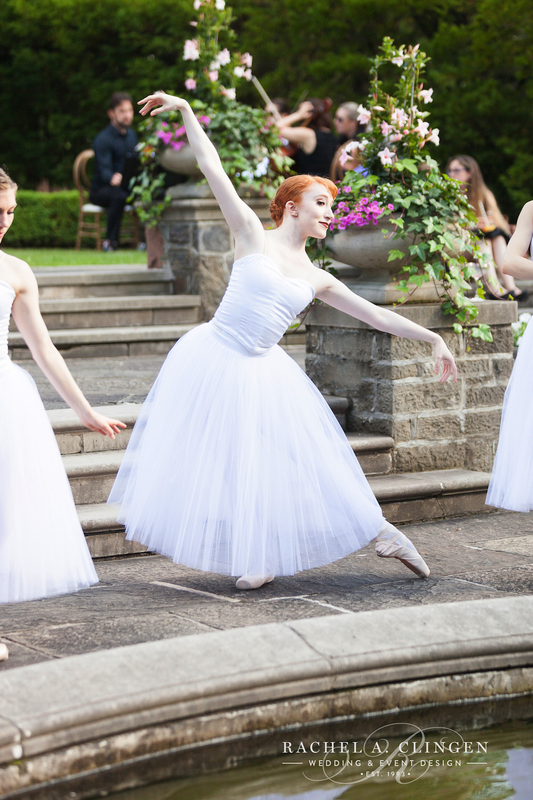 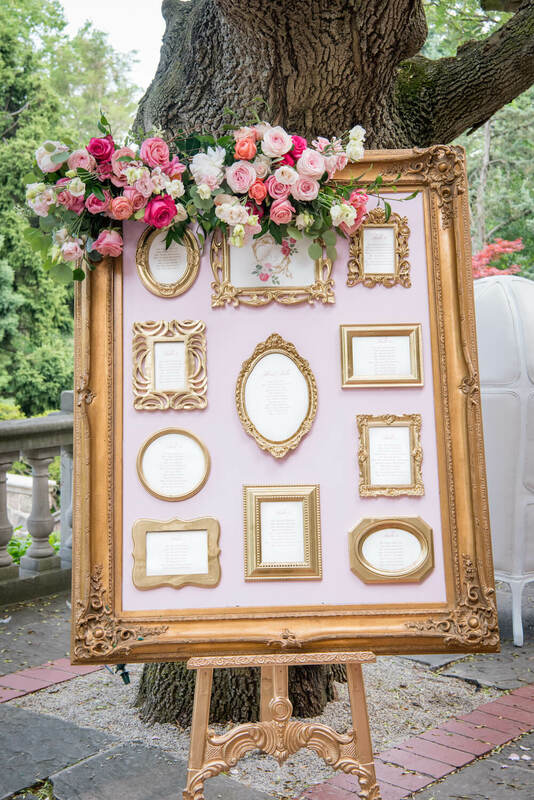 Now thats a garden wedding to remember!